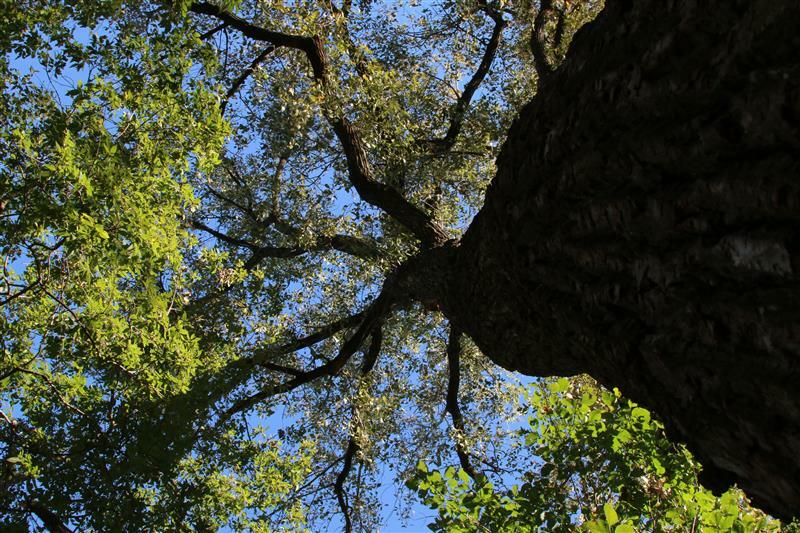 Inspire environmental citizenship through an understanding of the natural heritage of north central Texas by providing nature experiences, education and research programs, and conservation and restoration projects. 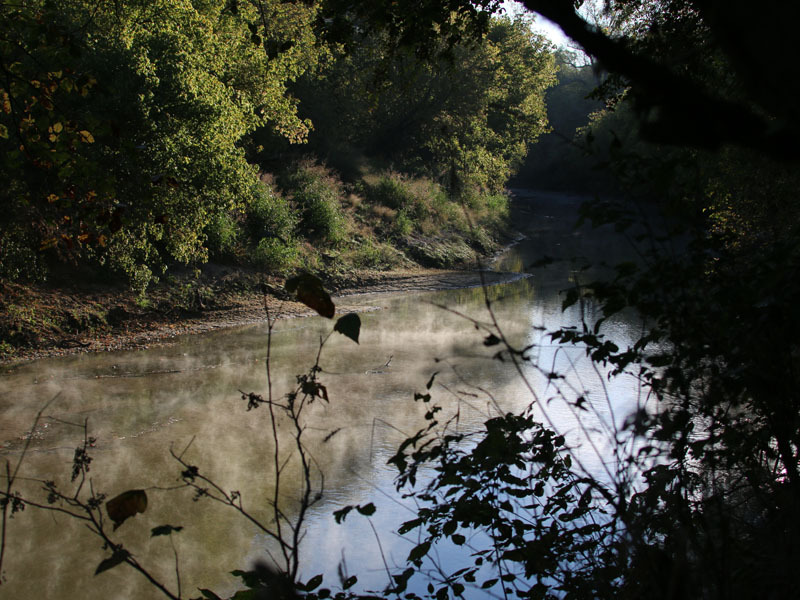 The CCNHC serves as a gateway to the approximately 2900 acres comprised of rare bottomland habitat, surprisingly diverse flora and fauna, all surrounding the confluence of Clear Creek and the Elm Fork of the Trinity River. To me this park was just a really wonderful place to hike and make interesting wildlife observations. 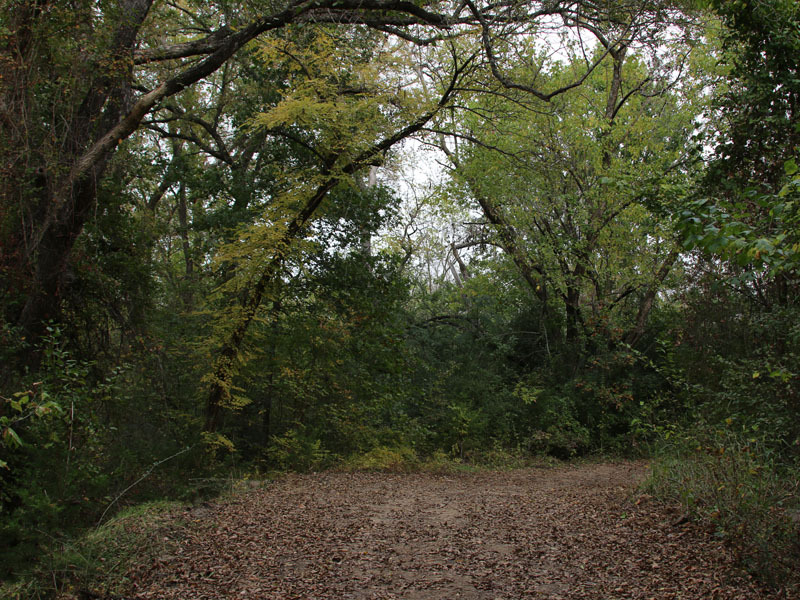 Clear Creek Natural Heritage Center has a very nice trail system that provides excellent coverage of the property. The well maintained soft surfaces paths take you through some of the most scenic areas the park has to offer. 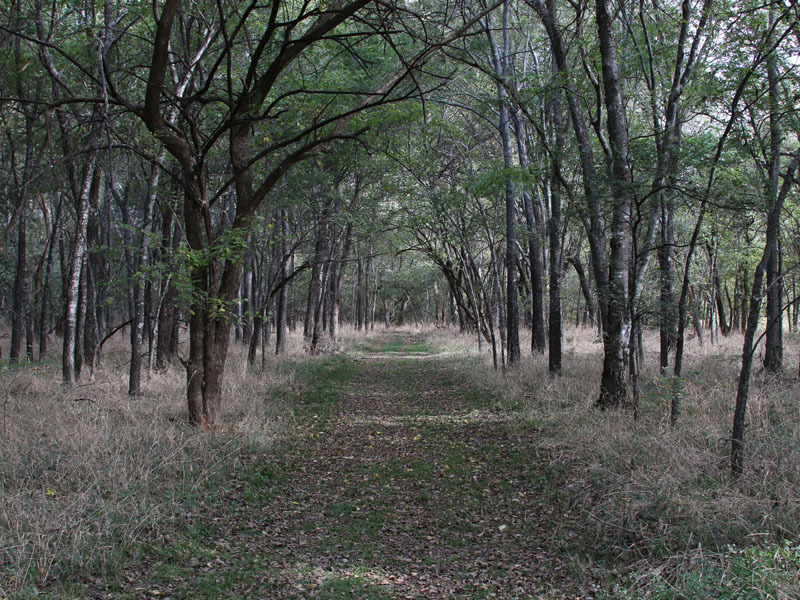 Trails cut through densely wooded riparian forest and across open native grassland prairies. 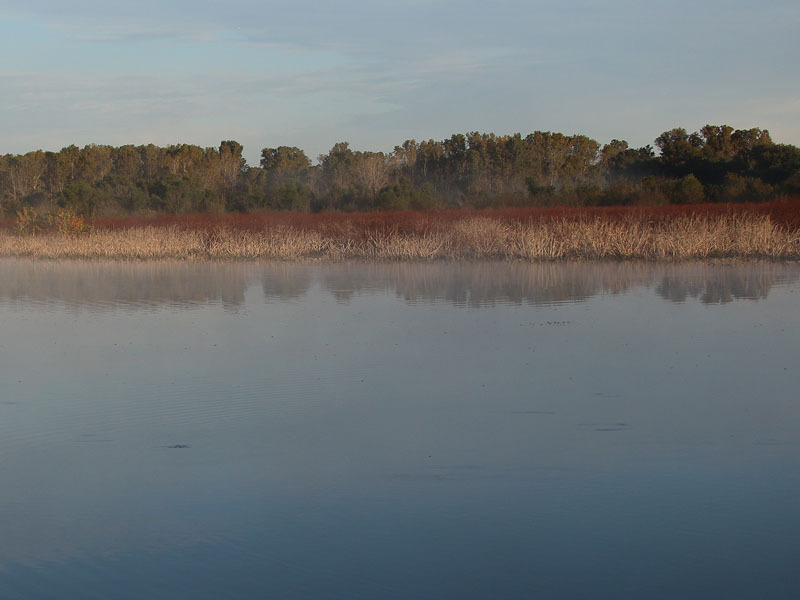 Some paths follow the Elm Fork and Clear Creek, while others skirt an expansive wetland area. Signs of wildlife abound in this park. 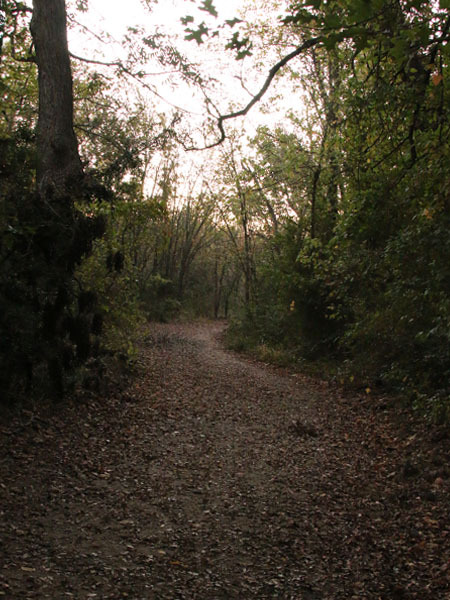 The trails are covered with the tracks of deer, Coyotes, and Raccoons. 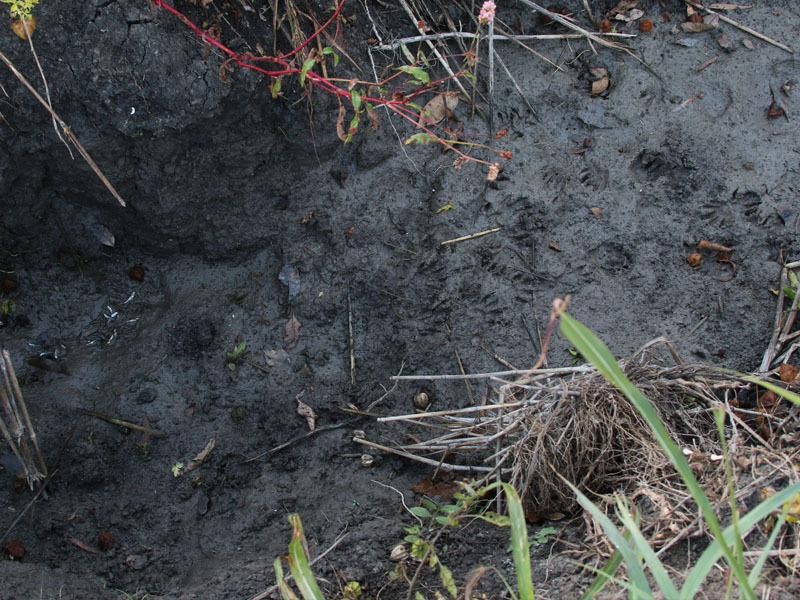 Along some sections of the trail there is evidence of Feral Hog activity. Birds of all types were present. 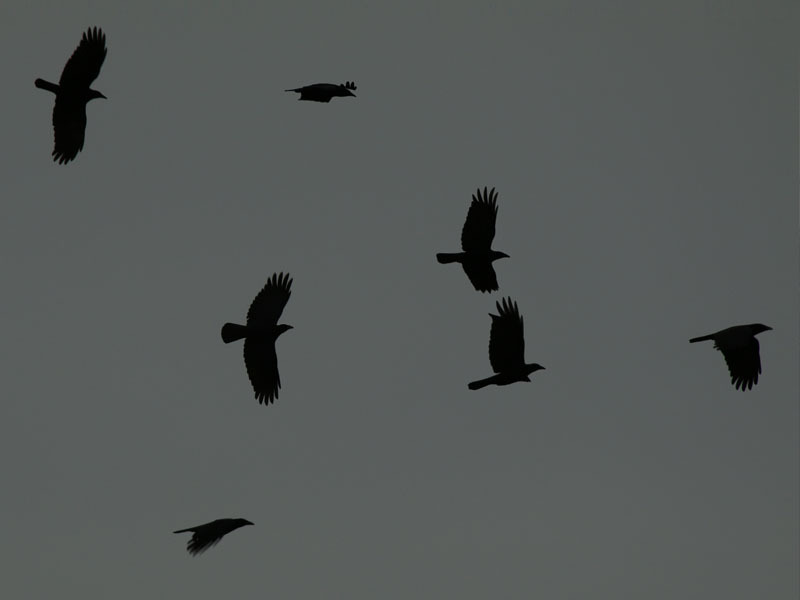 Huge flocks of migrating cormorants were observed headed south, following the general route of the river. 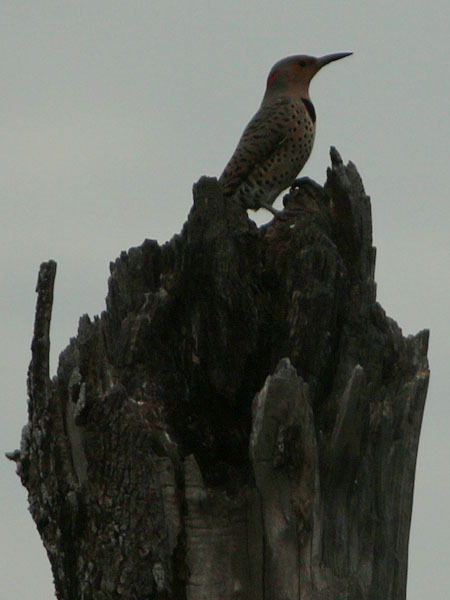 The knock knock knock of woodpeckers was a constant refrain emanating from the forested areas. 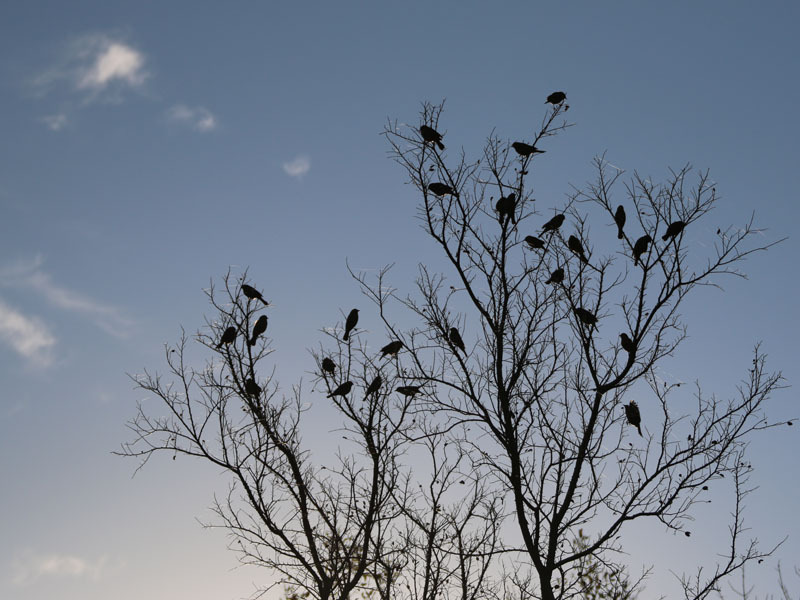 American Crows added to the chorus with their harsh caws. Robins and other birds were found foraging along the wetland margins, while hawks, falcons, and vultures soared above us all. I divided my efforts to explore Clear Creek Natural Heritage Center into two separate visits over the course of two different days. I conducted my first hike early in the morning, and I came back for an abbreviated walkabout the following afternoon just before dark. It was my hope that splitting the exploration up like this would give me a better feel for how the resident wildlife behaves over the course of a typical day. 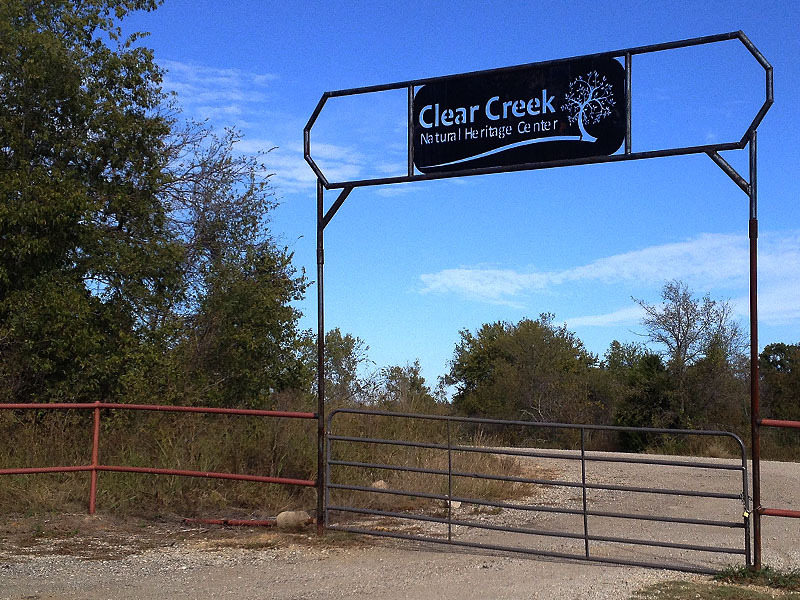 The entrance to Clear Creek Natural Heritage Center off Collins Road in Denton, Texas. 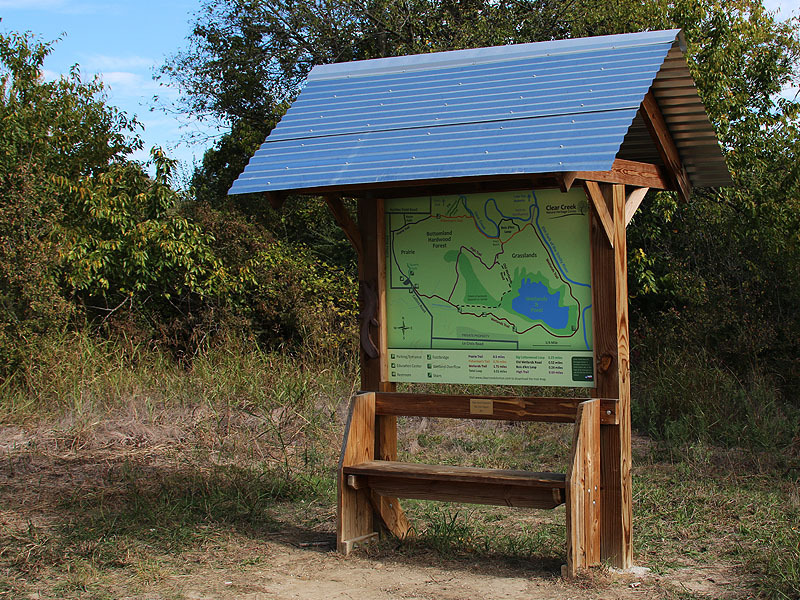 A kiosk with trail map at the trailhead. 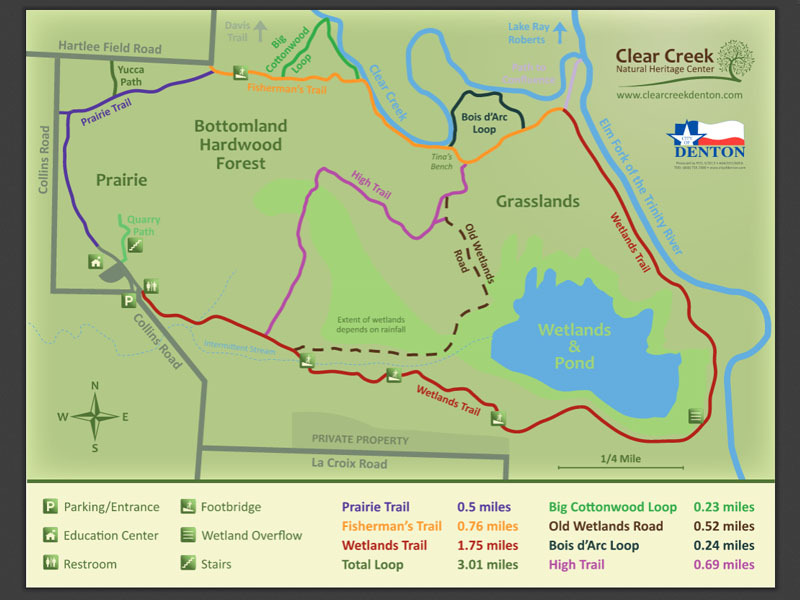 Clear Creek Natural Heritage Center Trail Map. 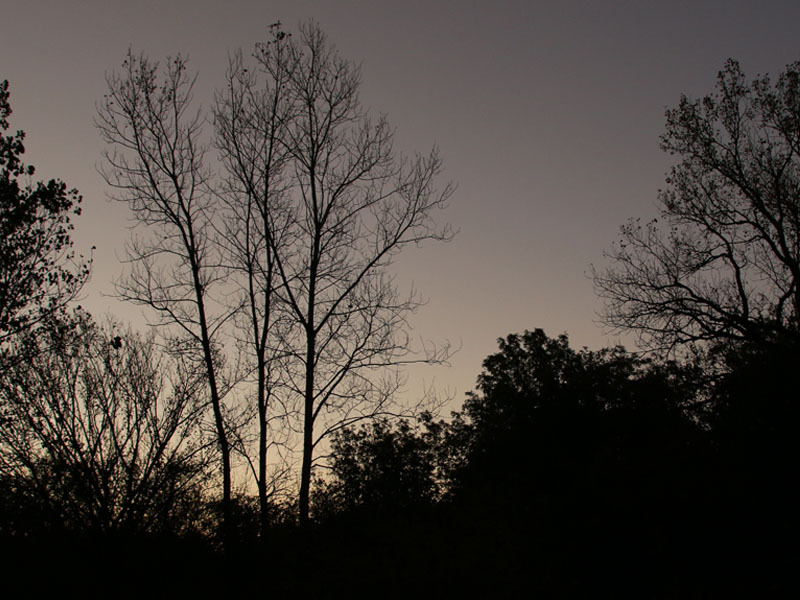 I arrived at the Clear Creek Natural Heritage Center with the first light of day. The temperature was right around 37F and the air was crisp. But the skies were clear, and there was the promise of a beautiful mid-autumn day that with the soft glow that was beginning to form on the eastern horizon. 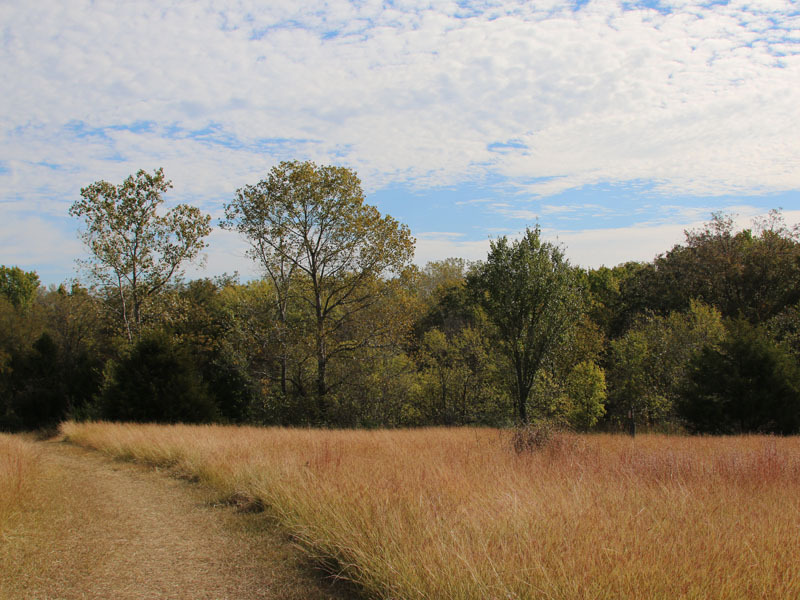 I began my hike at the trailhead off of Collins Road and headed east toward the wetland area. I wasn’t sure how much water this section of the park would be holding after our long hot summer, but I wanted to get there before the sun cleared the trees nonetheless. 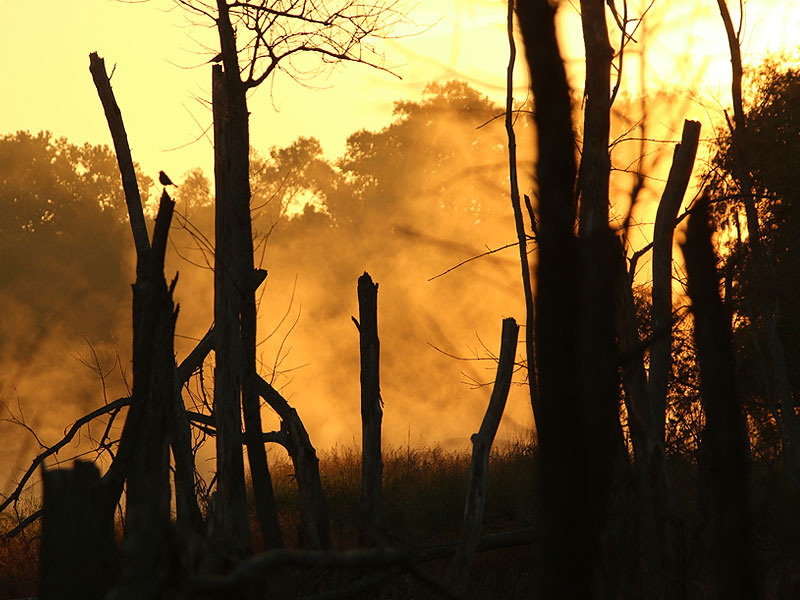 The walk through the forest was uneventful, as the morning twilight provided just the right amount of illumination. 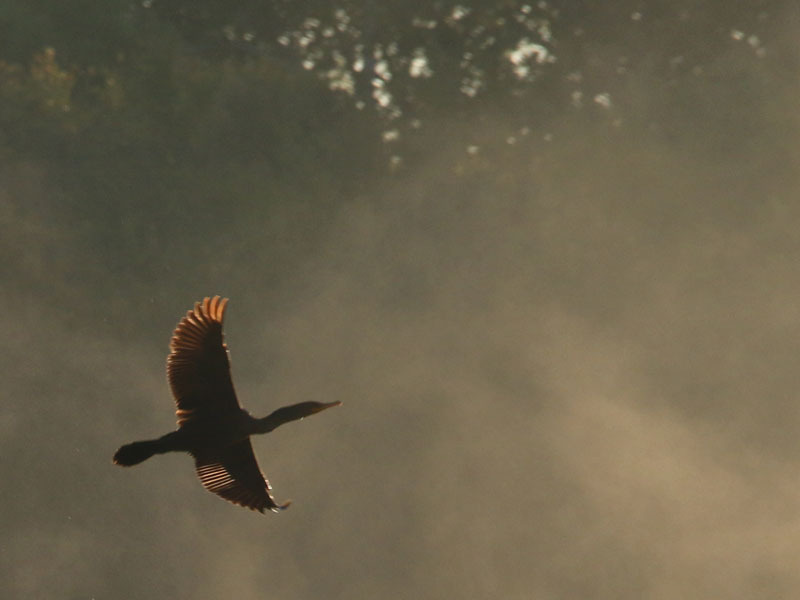 I exited the woods and stepped out onto the floodplain just as it was being bathed in the first golden rays of dawn. The soft light set the landscape aglow with the reds, oranges, yellows, and greens of early autumn. Luminous billows of fog, backlit by the sun, rose off the various ponds and lakes and draped the wetland in a shroud of mystery. The nice soft surface trail leading to the wetlands in the east. 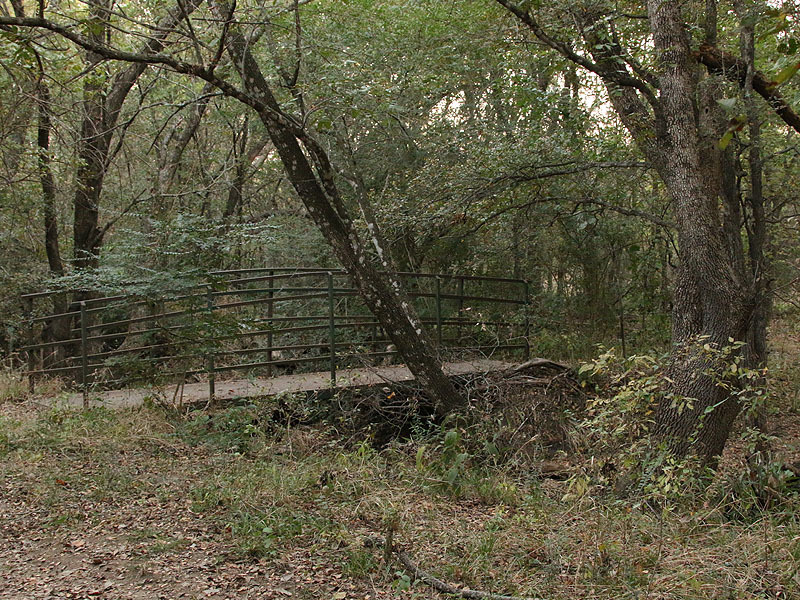 A bridge over an intermittent stream. Hundreds of Double-crested Cormorant flying by far on the other side of the river. 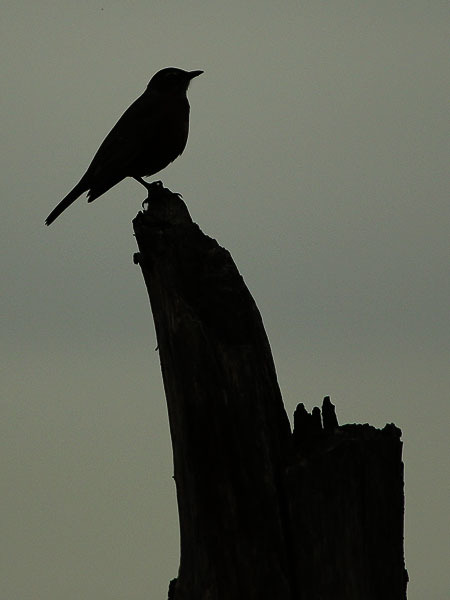 An American Robin in silhouette. 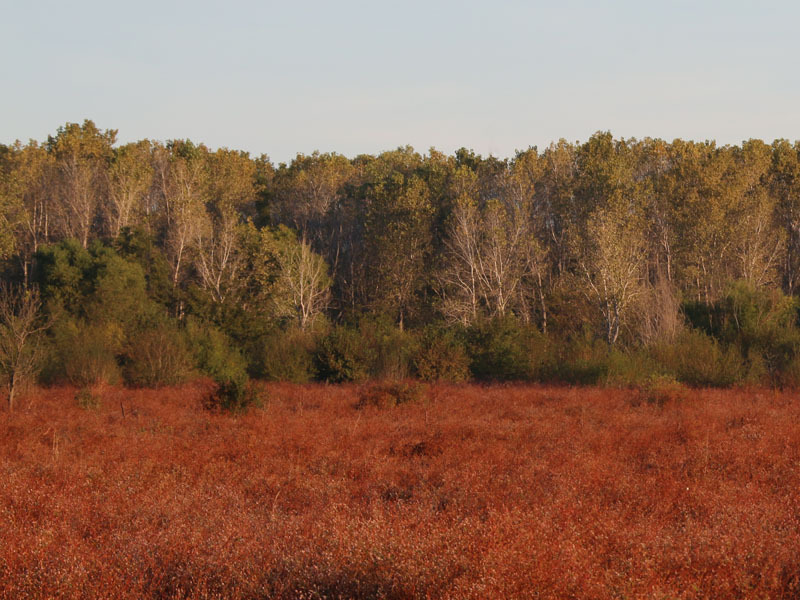 A field of red-orange wetland vegetation in front of a majestic grove of Cottonwood trees. 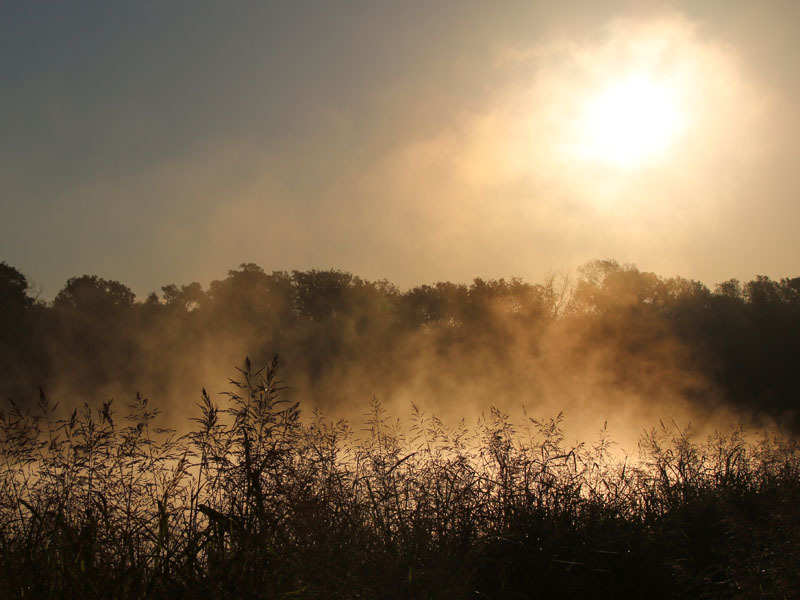 The sun rising over the fog enshrouded wetlands. The wetland pond as you near the river. As I approached one pond, but before it had come into view, there arose a ruckus of some sort, and a menagerie of waterfowl took to the air. I was exited. I imagined the birds were flushed by some predator—possibly a Bobcat—and that maybe I could steal a look at him if I were stealthy enough. I approached the water’s edge carefully, but found no furred marauder. It took a while to solve the mystery, but soon I noticed the protruding snouts of submerged Common Snapping Turtles in various places across the still water surface. Even on this cold morning, the large turtles were lurking under the murk and harassing potential prey. A Double-crested Cormorant takes to the air. A Common Snapping Turtle lurking in the murky pond water. A wetland pond as the fog began to dissipate. In the willow grove across from the wetlands, I found several large Paper Wasp nests hanging from branches near the trail. 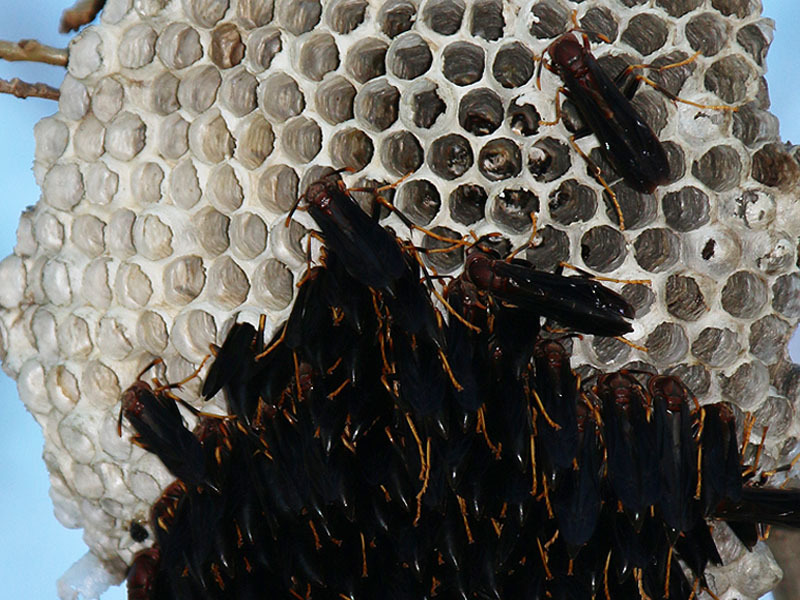 One nest was guarded by only a pair of wasps, but the another was covered by dozens of maroon and black insects. The wasps were in a heavy state of torpor, induced by the chill of the night. They were huddled together like this in a futile effort to resist the cold, no doubt. 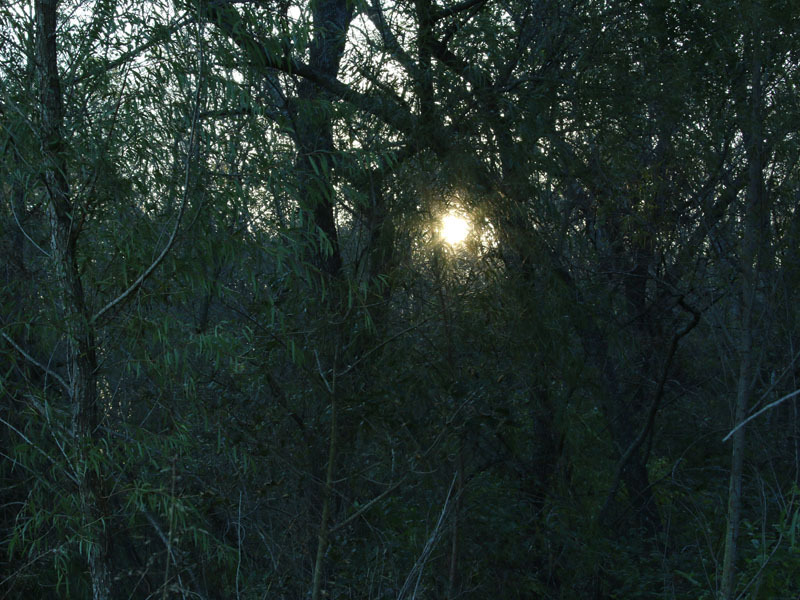 The sun shining through the willow grove opposite the wetlands. 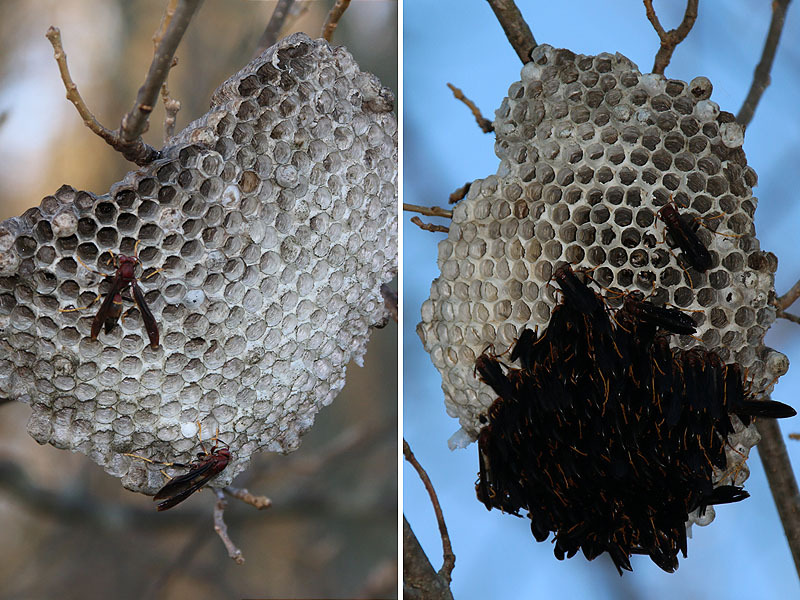 A pair of large Paper Wasp nests. A closer look at the densely packed insects. Nearby I found a peculiar jelly of mud and minnows that had formed in the bottom of a drying puddle of water. 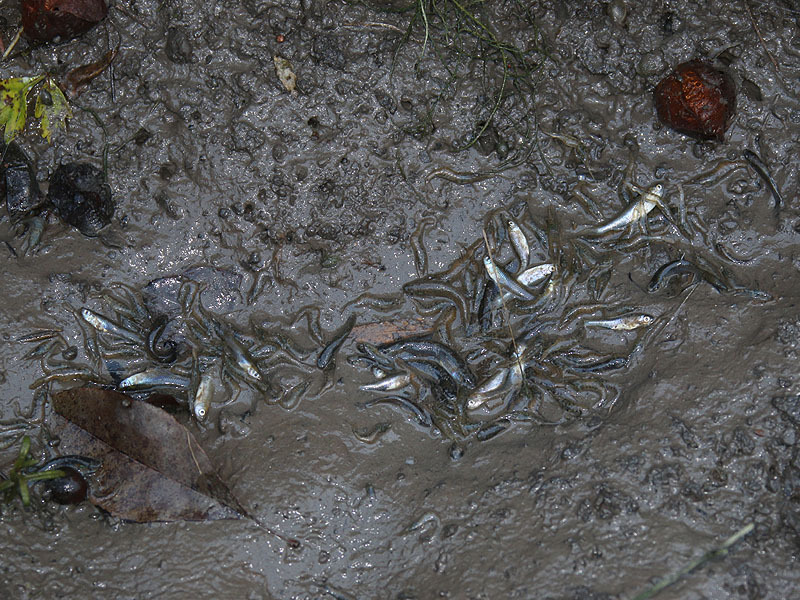 Numerous tracks made by snacking Raccoons led to and from the stranded collection of small fish. Western Mosquitofish trapped in a drying pool of water. A closer look at the mosquitofish. Notice the Raccoons tracks leading to and from the stranded fish. 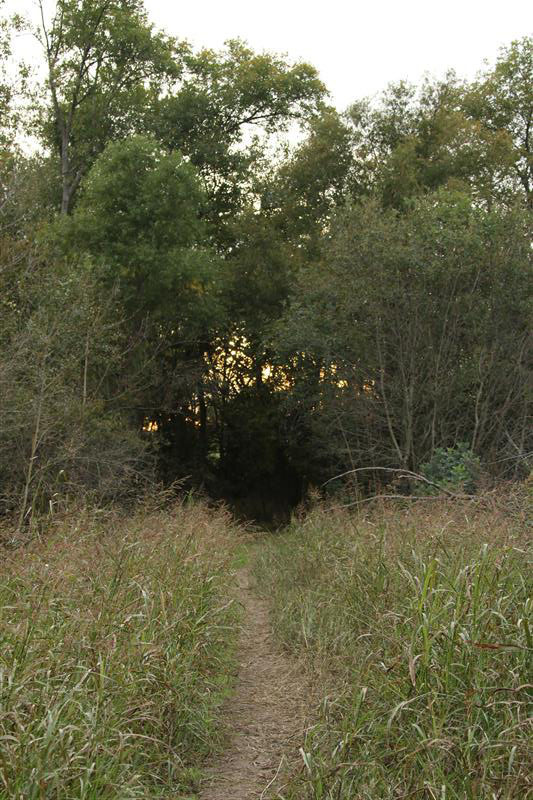 As I headed away from the wetlands, the trail began leading me to the river’s edge. Along the way, I was greeted by a flock of Red-winged Blackbirds arriving at the margins. Overhead, a group of Wood Ducks circled before disappearing behind the partition of trees shrouding a nearby small pond. 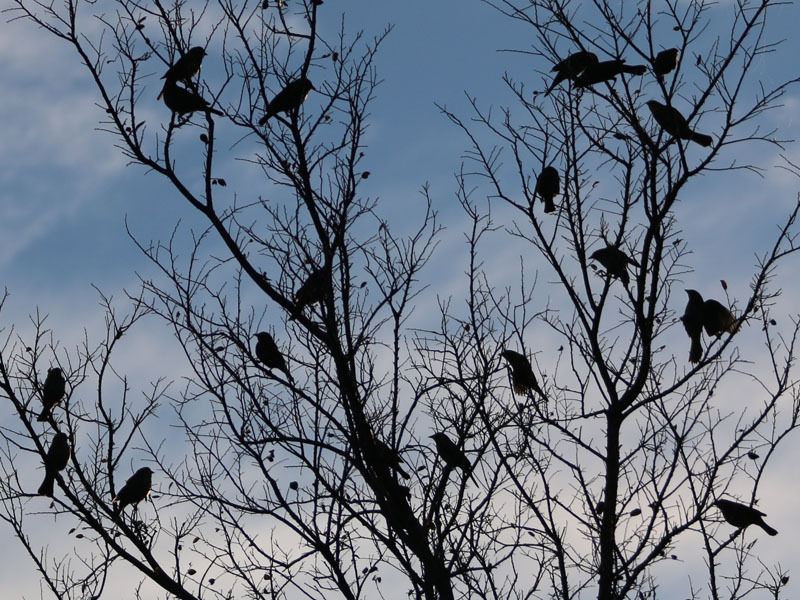 More blackbirds gathered in a nearby tree. 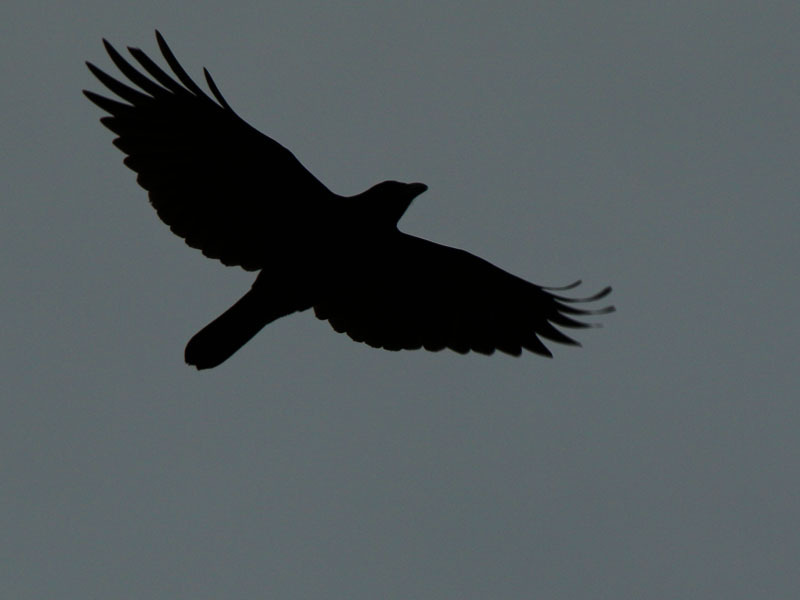 Red-winged Blackbirds are attracted to wetland areas. 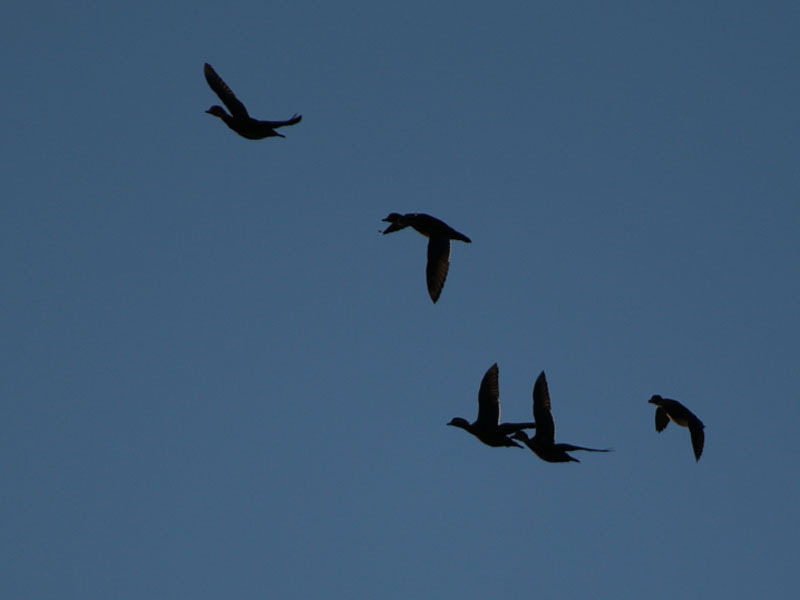 A group of young Wood Ducks overflying the wetlands. A few step further along and I had my first look at the Elm Fork of the Trinity River. Wisps of fog still slithered off its surface. The confluence of the Trinity and Clear Creek was the next item of business on my to do list. The trail I was following parallels the river for most of the way. 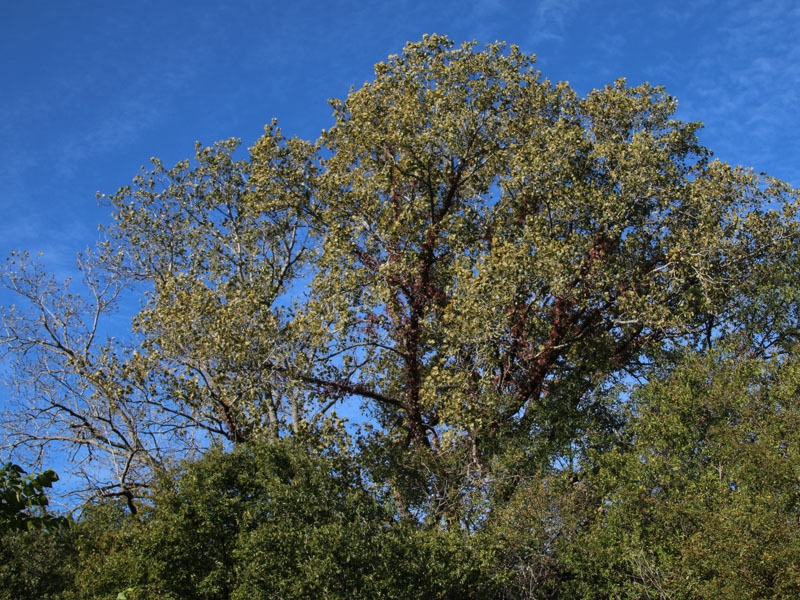 Massive Cottonwood trees can be found along this route, as can tiny Winter Wrens. The Wetlands Trail as it begins to follow the river. My first look at the Elm Fork of the Trinity River. 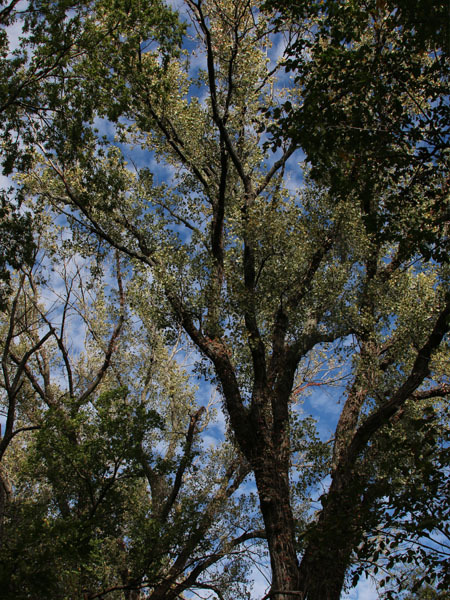 There are soaring Cottonwood trees along the river. 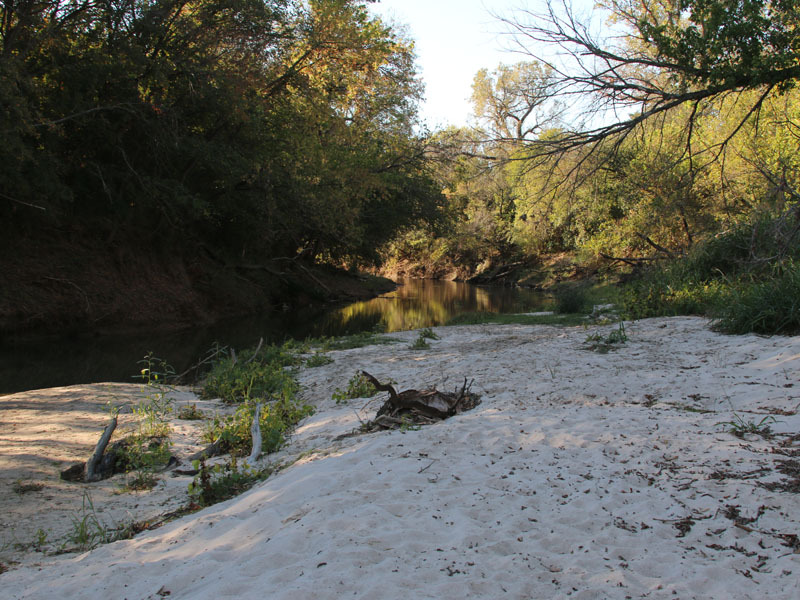 The meeting of Clear Creek and the Elm Fork is marked with with a sizable mound of near beach-quality white sand. 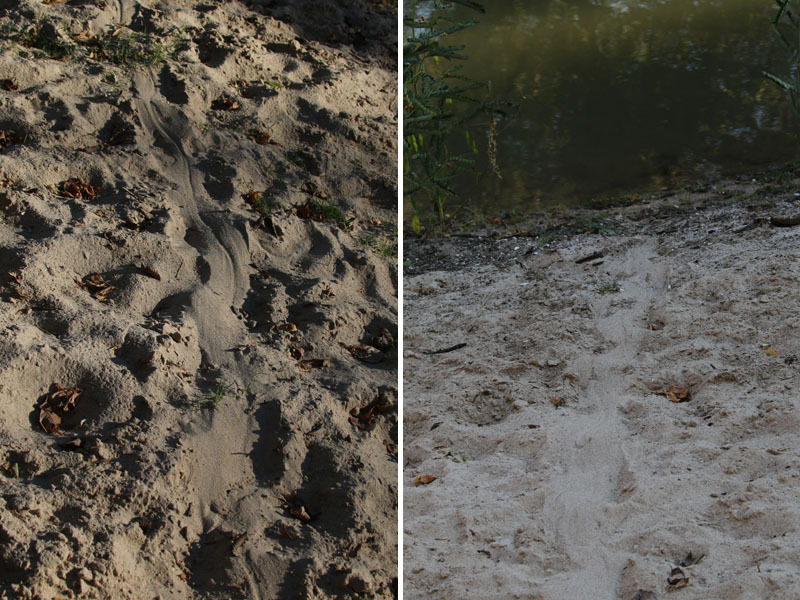 I found evidence here of what I think are a pair of River Otter slides, side by side, and leading from the woods to the water. The North American river otter is more social than most mustelids. In all habitats, their basic social group is the family, consisting of an adult female and her progeny. Adult males also commonly establish enduring social groupings, some documented to comprise as many as 17 individuals. 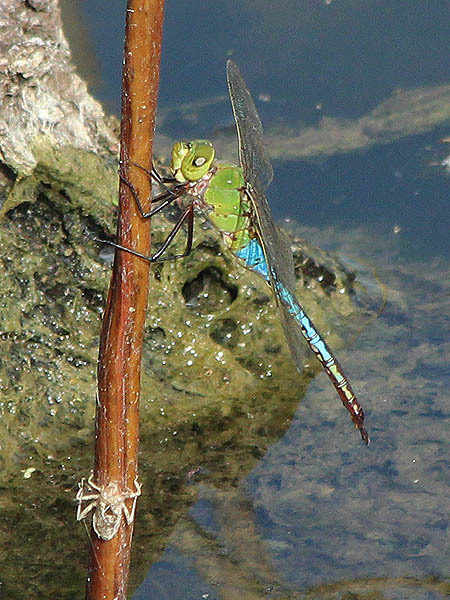 In coastal areas, males may remain gregarious even during the estrous period of females. Family groups may include helpers, which can be made up of unrelated adults, yearlings, or juveniles. Male otters disperse from such family groups more often than females. When females leave, they tend to move much further away (60–90 km or 37–56 mi) than males (up to 30 km or 19 mi), which tend to move shorter distances. Male river otters do not seem to be territorial, and newly dispersing males may join established male groups. On occasion, groups of unrelated juveniles are observed. River otters living in groups hunt and travel together, use the same dens, resting sites, and latrines, and perform allogrooming. In freshwater systems, groups occur most often in autumn and during early winter. From mid-winter through the breeding season, adult females move and den alone. River otters are not territorial, but individual otters of different groups portray mutual avoidance. Home ranges of males are larger than those of females, and both sexes exhibit intra- and intersexual overlap of their domains. The confluence of Clear Creek and the Elm Fork. A pair of River Otter slides leading into the creek. 12/04/2014 NOTE: I have been informed that this sign is most likely that of Beavers dragging their tails through the sand. I agree with that assessment. Considered in this light, it does seem unlikely that otters would attempt to slide over dry sand like they would on mud or snow. 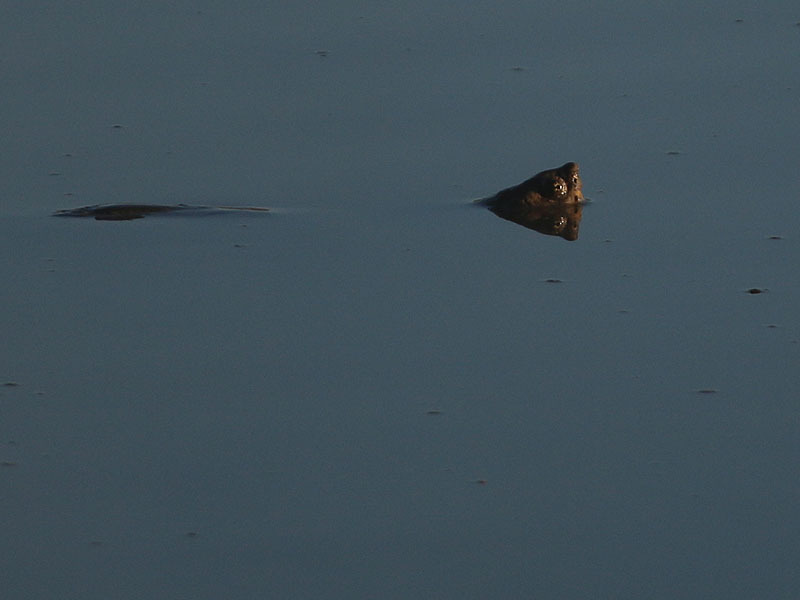 Beaver are also the far more common of the two species in our area. A sand bank on the Trinity River. After visiting the confluence, I moved on again by following Fisherman’s Trail as it follows the general course of Clear Creek to the west. I was making my way to the High Trail cutoff in order to explore the interior of the park. A short trip down the High Trail and I picked up the Old Wetland Road leading right into the heart of the wetland area. From here I circled around to the High Trail once again and then followed it back to my starting point. Much of this route was through a dense forest which wrapped the trail in tunnel of overhanging branches. I believe I had the park mostly to myself at this point in the morning, and the isolated nature of this trail really reenforced my sense of solitude. Fisherman’s Trail as it approaches the High Trail cutoff. 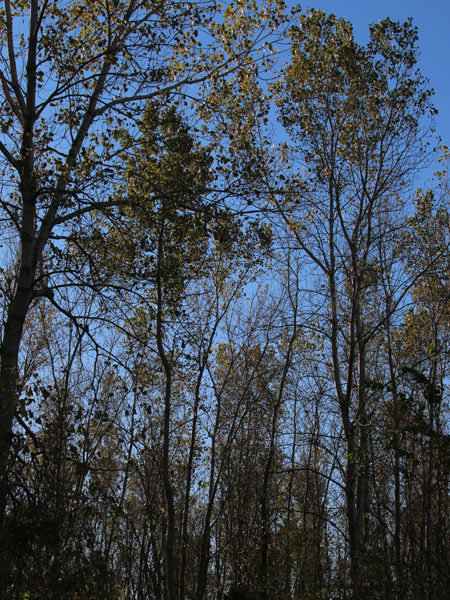 Beautiful trees along the east side of the wetlands. This is the view that awaits you at the High Trail cutoff. 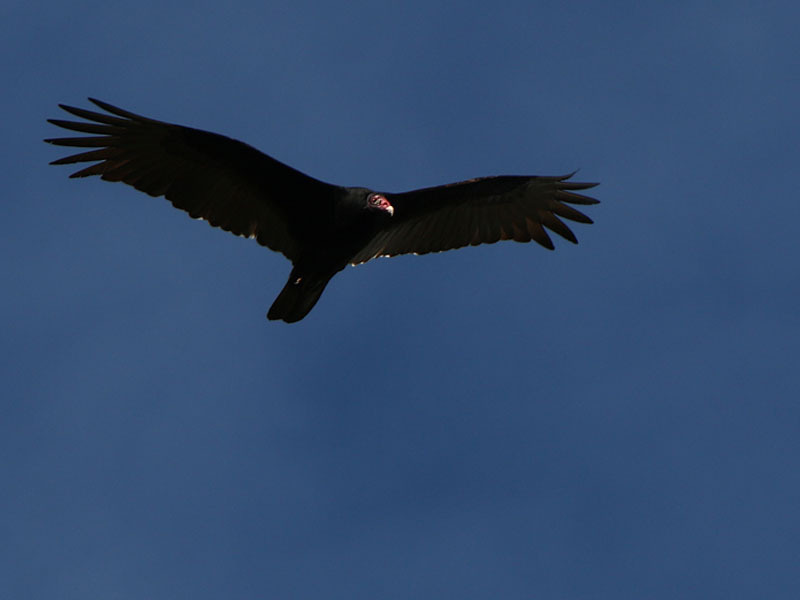 A small clearing provided me with a chance to see this low flying Turkey Vulture. 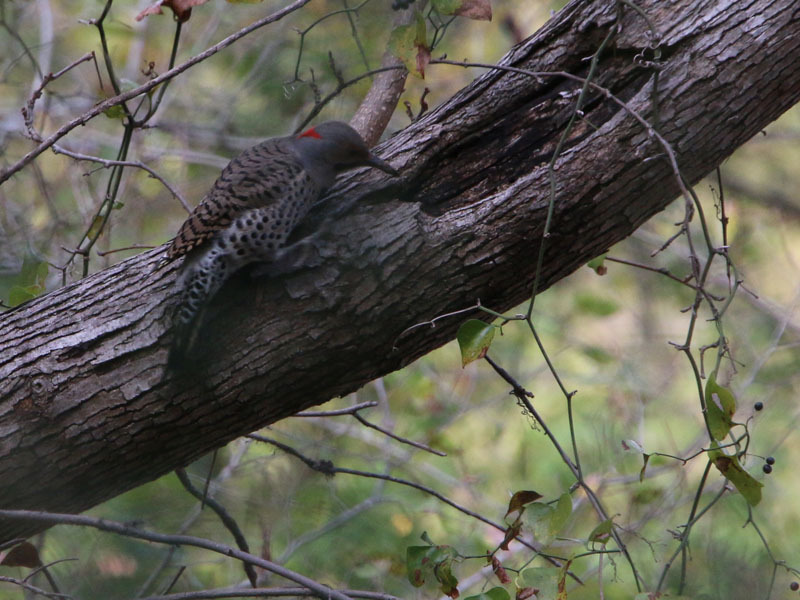 A Northern Flicker feeding from a knothole. 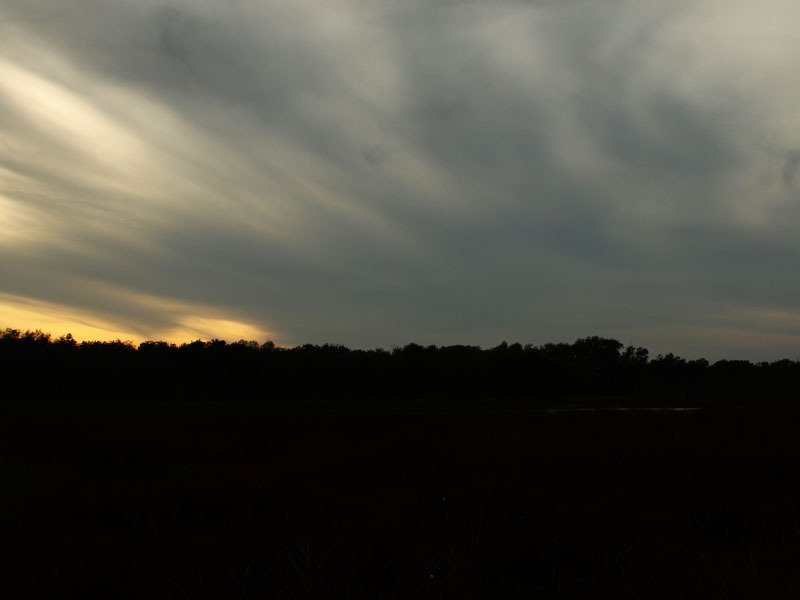 The High Trail skirts the western edge of the wetlands before zigzagging back to the east and then to the north. There it intersects again with Fisherman’s Trail, and it was here that I began following this path to the east along the banks of Clear Creek. 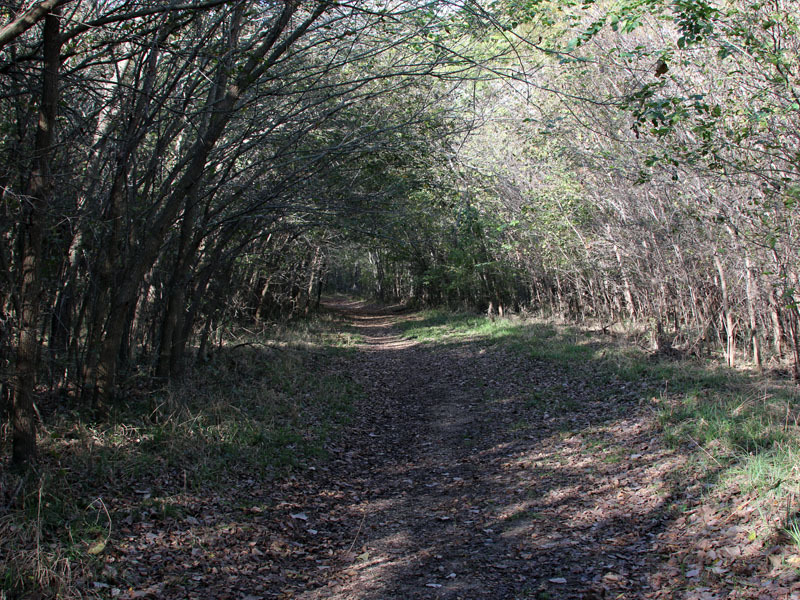 The trail is clear and well maintained through this stretch, but it narrows considerably as the woods become denser. Another set of stunningly massive Cottonwoods trees can be found along this pathway. Back on the Fisherman’s Trail. Majestic Cottonwoods follow the creek too. The woods just before the Prairie Trail cutoff. 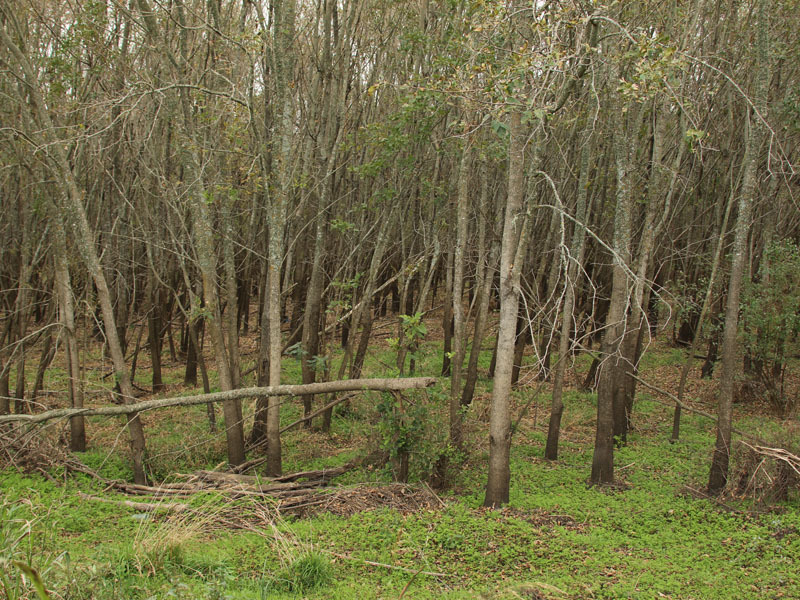 I knew instinctively that this section of the park was prime White-tailed Deer habitat. I had seen an abundance of sign along the trail all morning long. I had even clumsily flushed a couple of deer at various places along the way when I stepped off trail briefly in a less than discreet way. 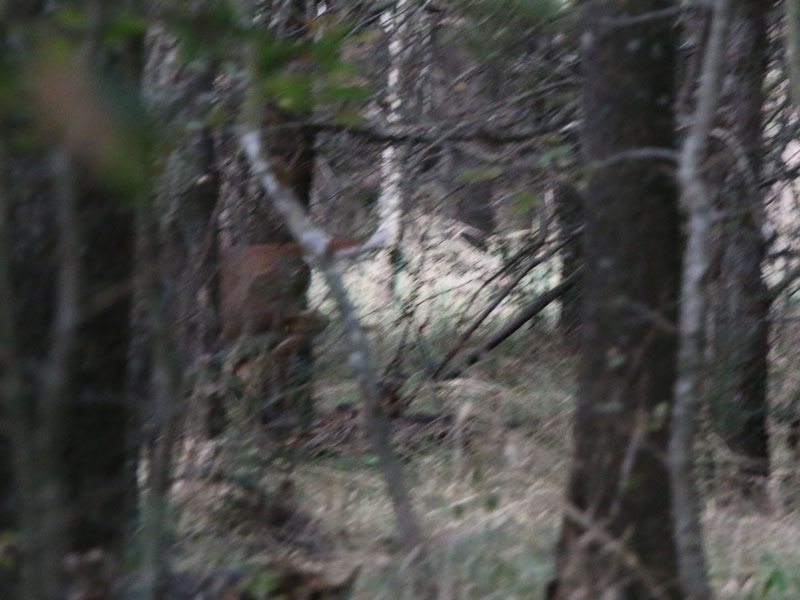 I just had a feeling, that if I kept the faith, I would have a nice candid whitetail encounter before the morning was over. Sure enough, it was here along the last leg of the Fisherman’s Trail that I finally came across a deer with his guard down. 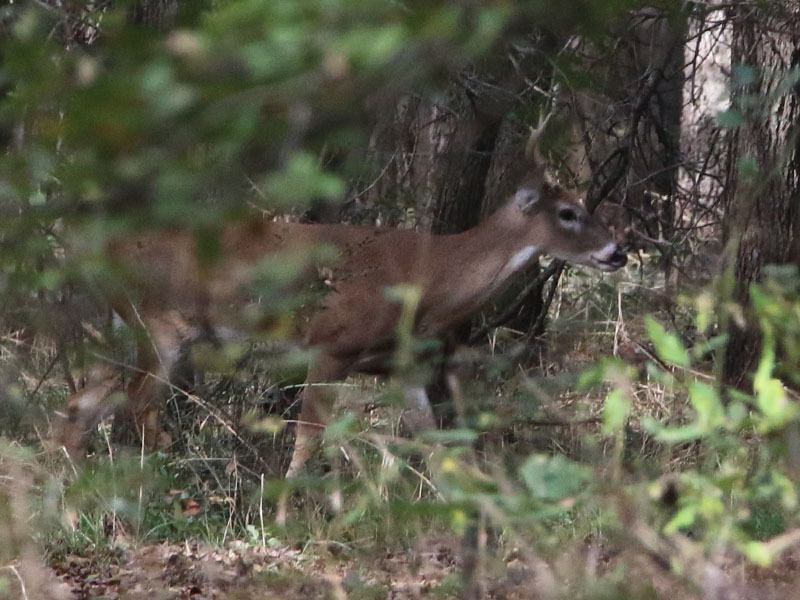 I was alerted to the presence of this young buck when I caught the faints sound of hoof steps through the leaf litter. I stopped to listen just in time for the deer to emerge from the woods and crossed the path roughly 30 yards ahead of me—the picture is included below. 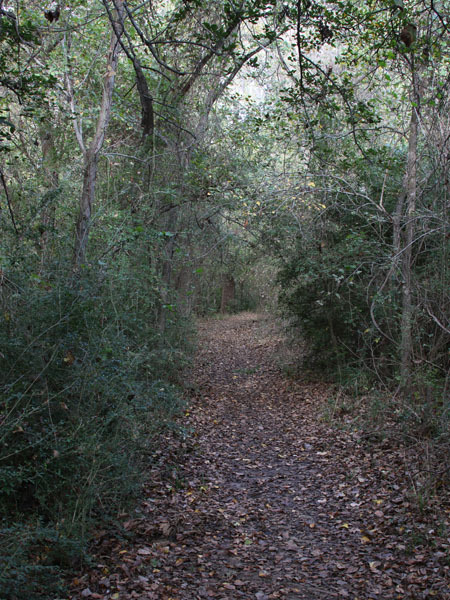 There was only time for a fleeting glimpse, however, as the deer gingerly crossed the path and soon disappeared into the heavy brush on the opposite side of the trail. A White-tailed Deer cautiously crossing the trail. I had watched the deer cross in front of me. I saw were he went and I knew where to look for him. He, on the other hand, did not even know I was there—that fact gave me a decided advantage. So, now the game was afoot. Would I reacquire the deer and have a chance for some more pictures before he fled, or would he see me first? It would be a contest of wilderness prowess. Who had the keenest senses? Who had the stealthiest movements? A relic of a time gone past. 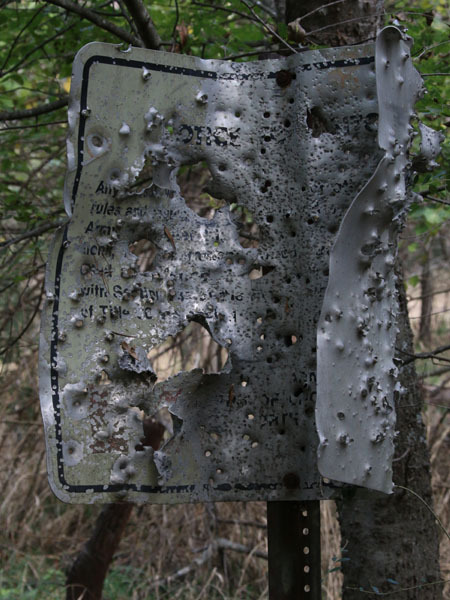 I don’t believe shooting or hunting is allowed on the property any longer. Just a little further on and I reached Prairie Trail—the last leg of the trail system that I intended to cover on this morning. 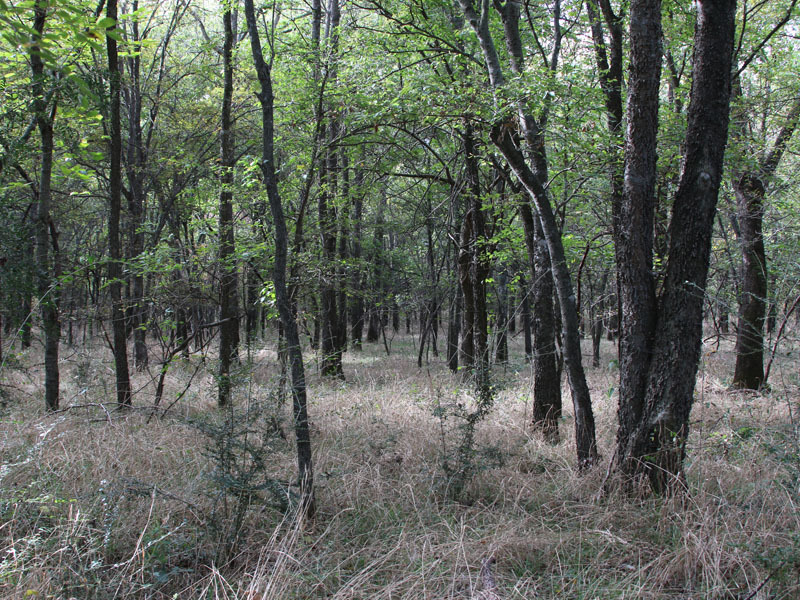 The forest gives way here to a gorgeous grassland prairie covering a gentle rise. 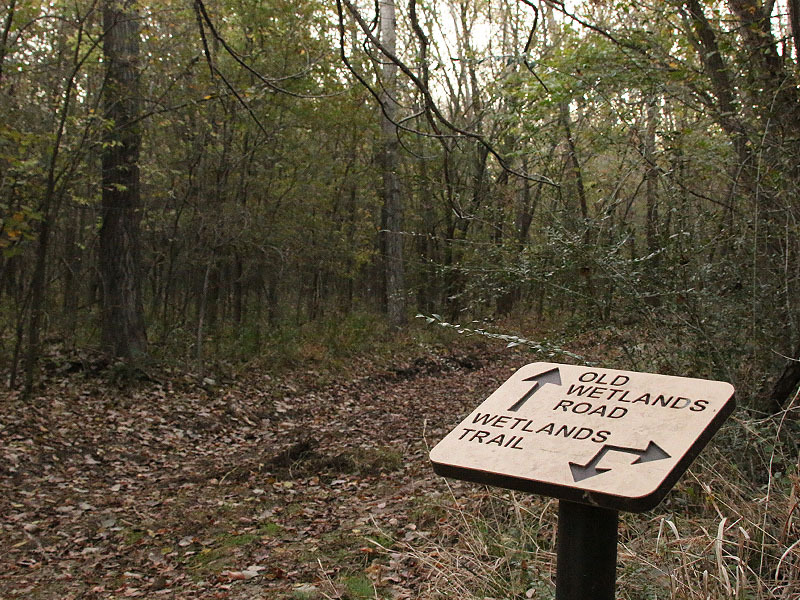 Following the trail to the top gives you a commanding view of the bottomland forest all the way to the river and beyond. From this rise, it was only a short distance back to my car. It was time to call it a day and begin making plans to return on the following evening. 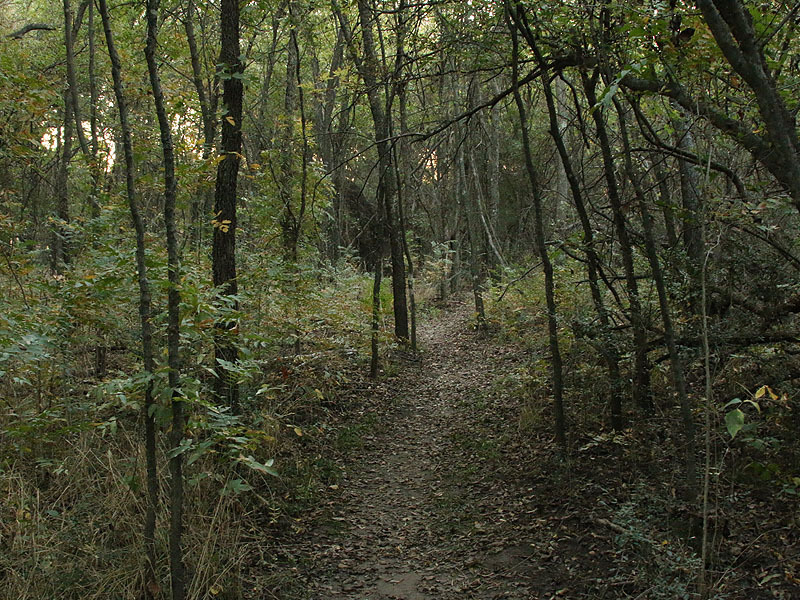 The Prairie Trail as it exits the woods. Looking back the way I had just come. 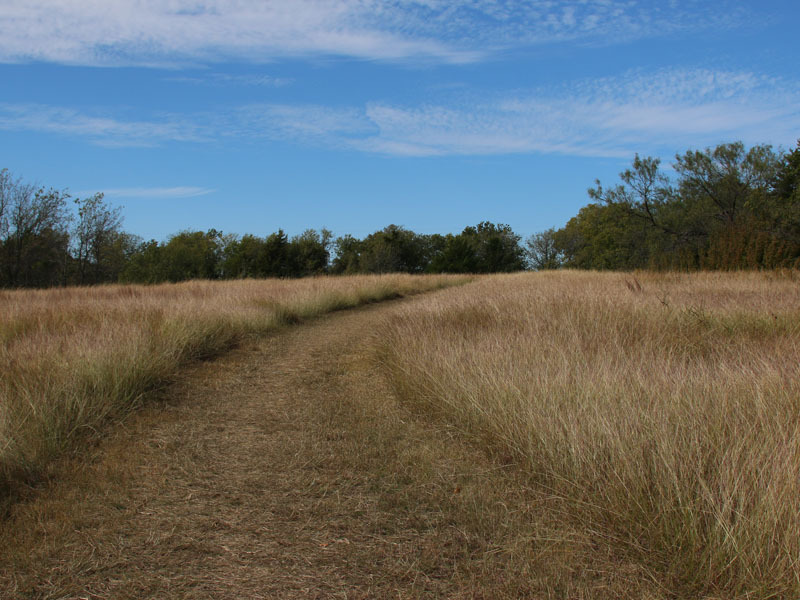 The grasslands along the Prairie Trail. I arrived the next afternoon at around 3:00pm. We had set the clocks back an hour overnight, so it would be getting dark around 6:00pm. That only gave me a couple of hours for this abbreviated hike. 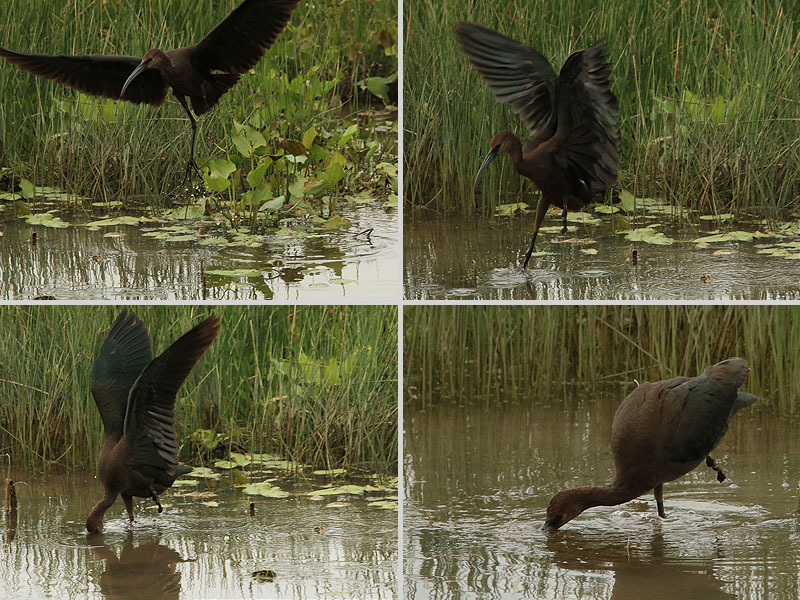 Again, I headed off on the Wetlands Trail. The ponds and the floodplain down by the river were my objective for the evening. 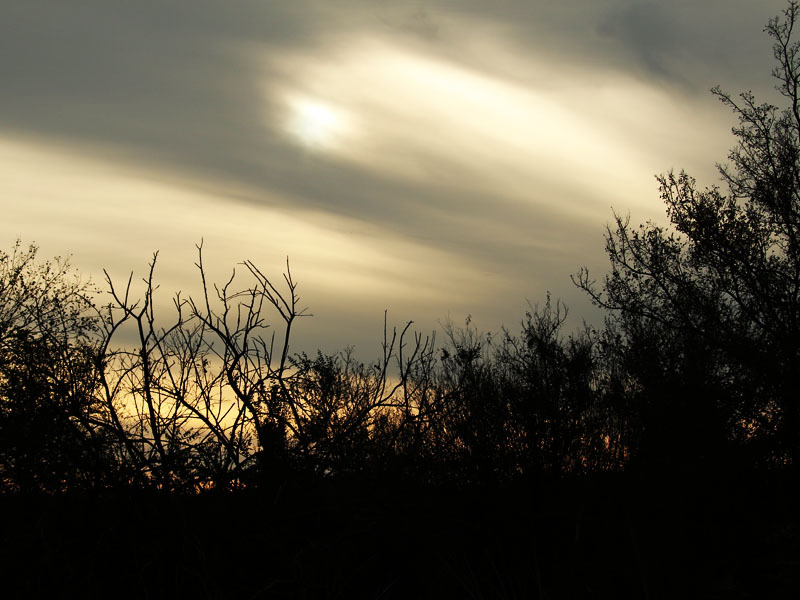 The sky was overcast this afternoon, and it was decidedly gloomier than the beautiful sunny weather on the day before. Shadows in the park were already starting to grow long by the time I hit the trail. I double-timed it down the path in order to arrive at my destination while there was still some quality light available for photographs. I emerged from the woods and out onto the floodplain only a short time later. Heading toward the wetlands late in the afternoon. A dry intermittent stream bed. The trail leading out of the woods and on to the wetlands. Though dry now, this area has obviously held water in the past. It was a bit grayer and gloomier on this visit than on my first. 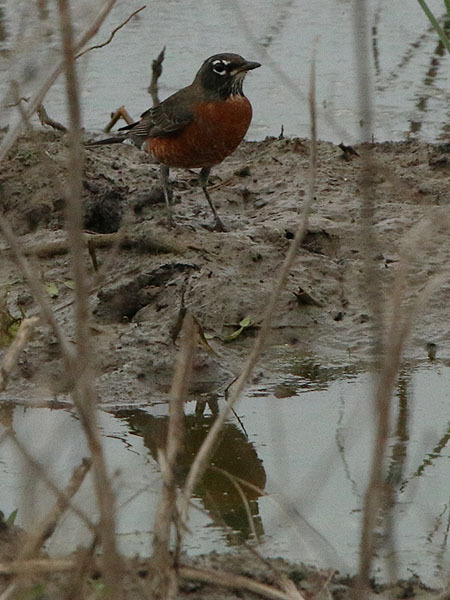 American Robins by the dozens congregated in the overgrown mud flats in the lowland. 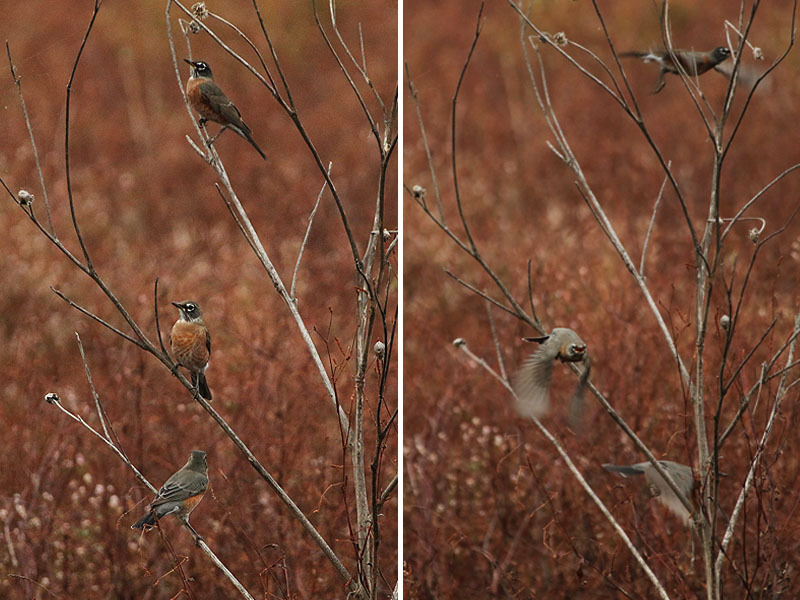 The gregarious robins were busy feeding, drinking, and bathing where the wetland vegetation met the water. 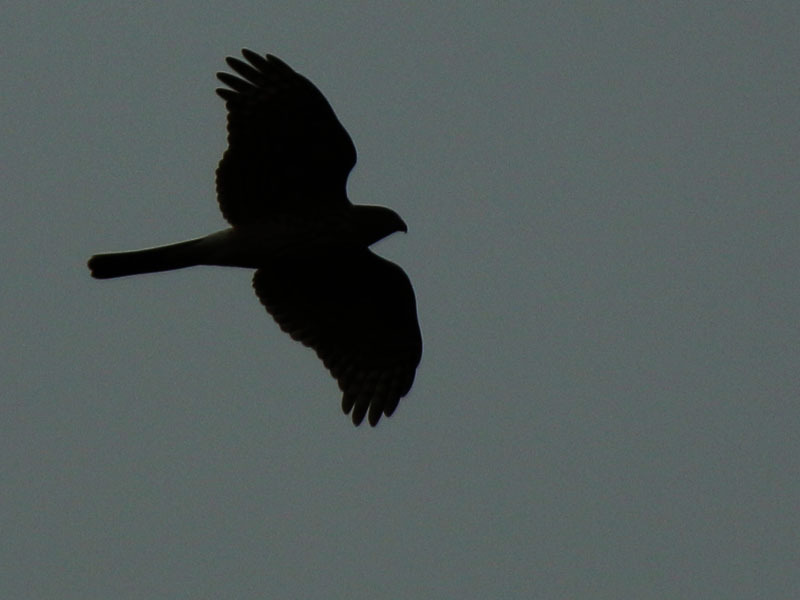 Many other birds also were attracted to this location. 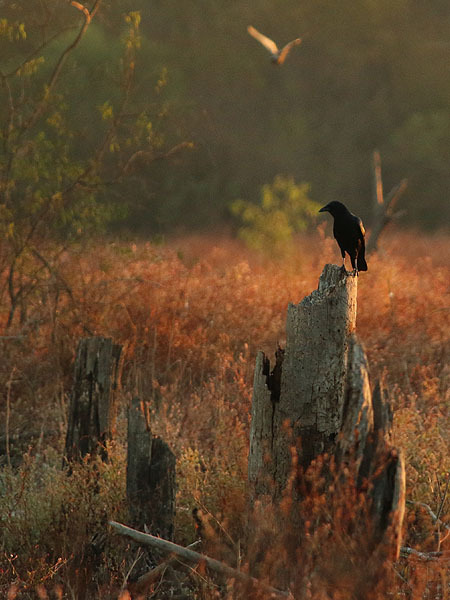 Northern Flickers, American Crows, White-faced Ibises, Black Vultures, and a pair of Cooper’s Hawks all where spending time around the wetlands in the last light of day. 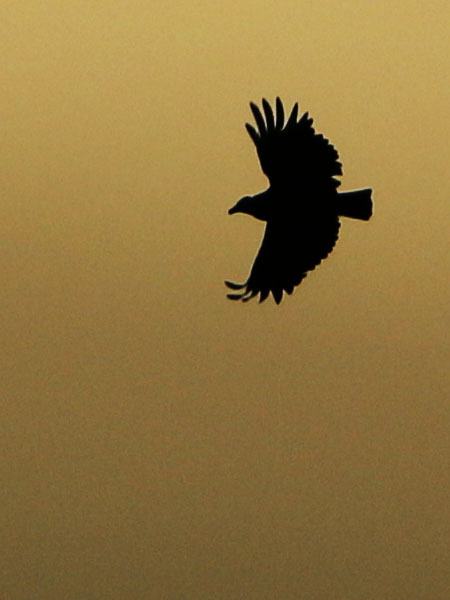 The setting sun caused the gray sky to glow with an eerie light, and this allowed me the opportunity to take pictures of several of these birds in stark silhouette—with interesting results. 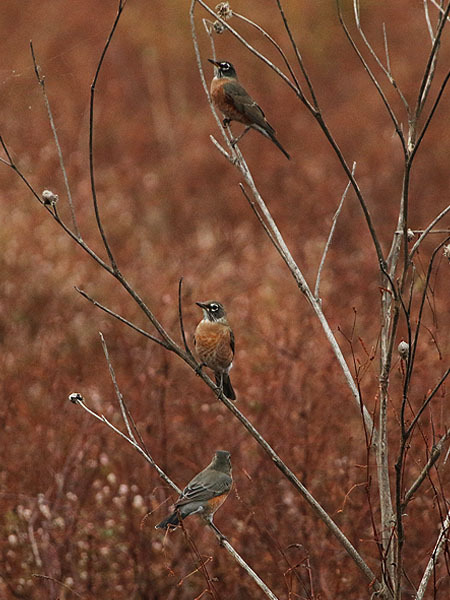 Dozens of American Robins congregated on the floodplain. Many foraged near the water’s edge. 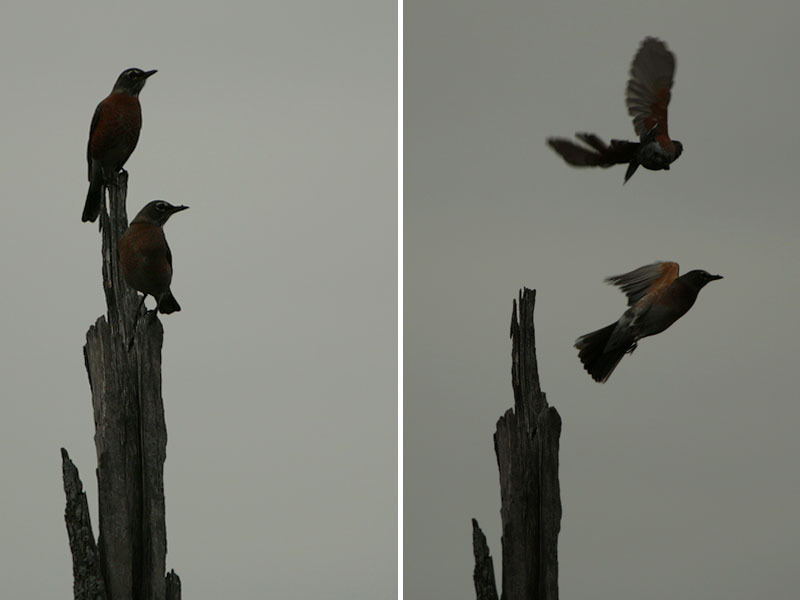 The active robins stayed on the move constantly. 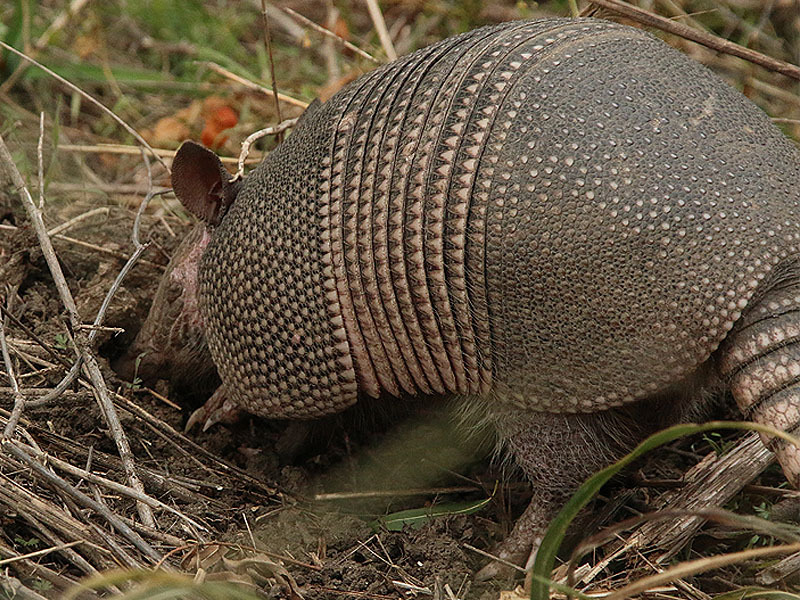 It was a foraging Armadillo distracted me momentarily from the sky and indirectly lead me to one of my more intriguing encounters of the afternoon. 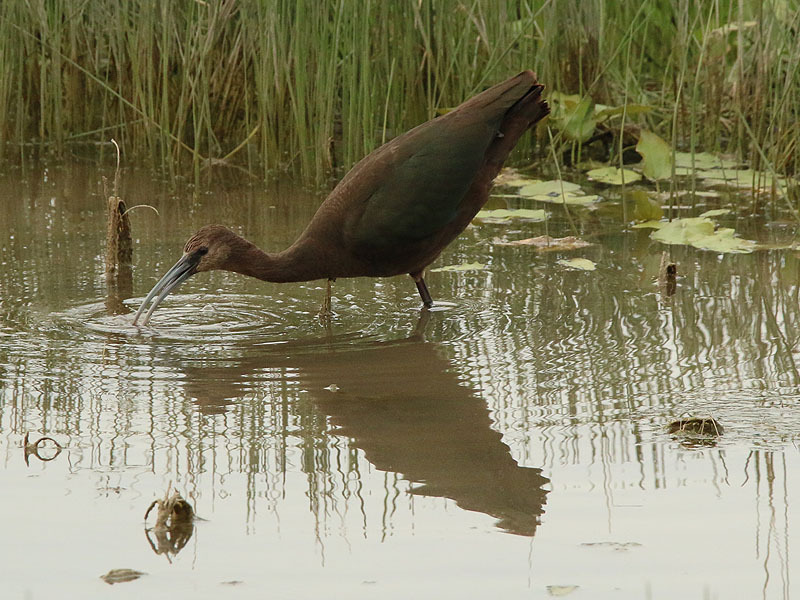 Nearby, in a small pool of water, I spotted the one-legged juvenile White-faced Ibis pictured below. 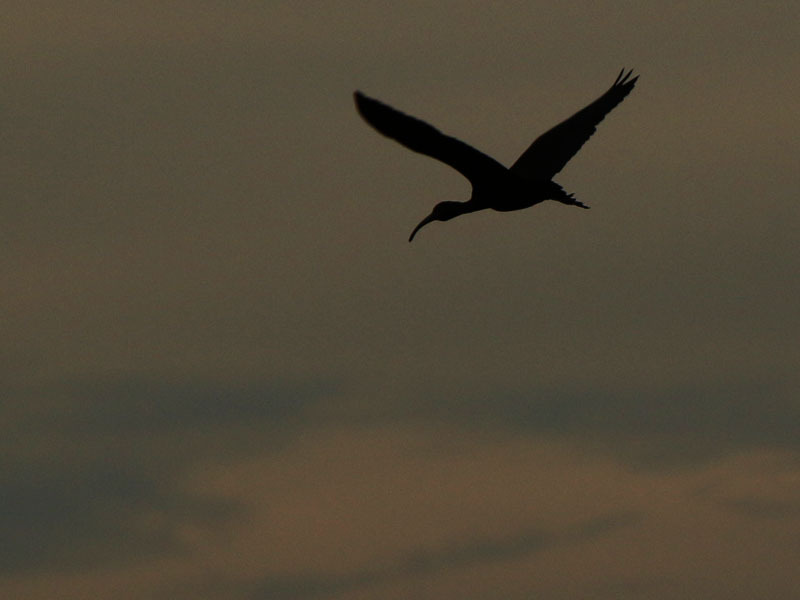 The ibis is missing its left leg from the knee down. In spite of this terrible injury the ibis looked fit and seemed to be managing his condition well. He did not appear to be in any pain, and was able to forage for food without too much difficulty. But looks can be deceiving. 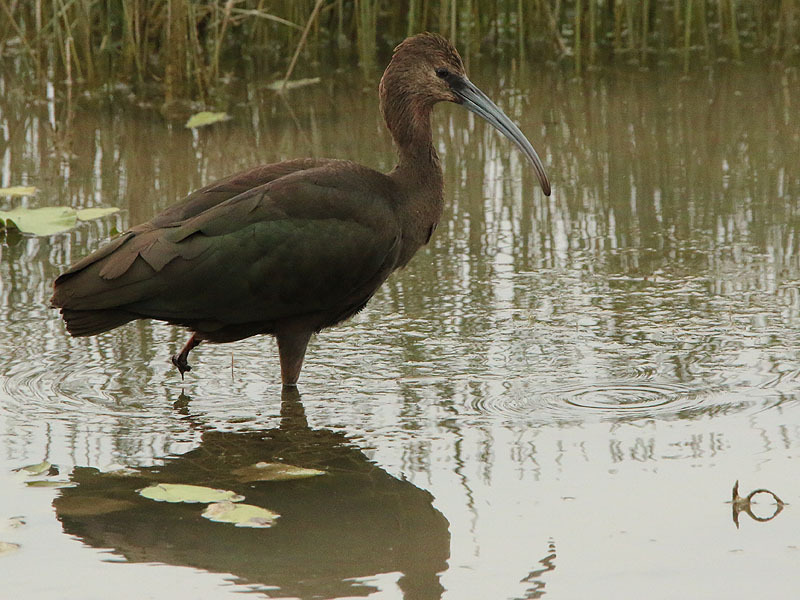 White-faced Ibises usually travel in groups. 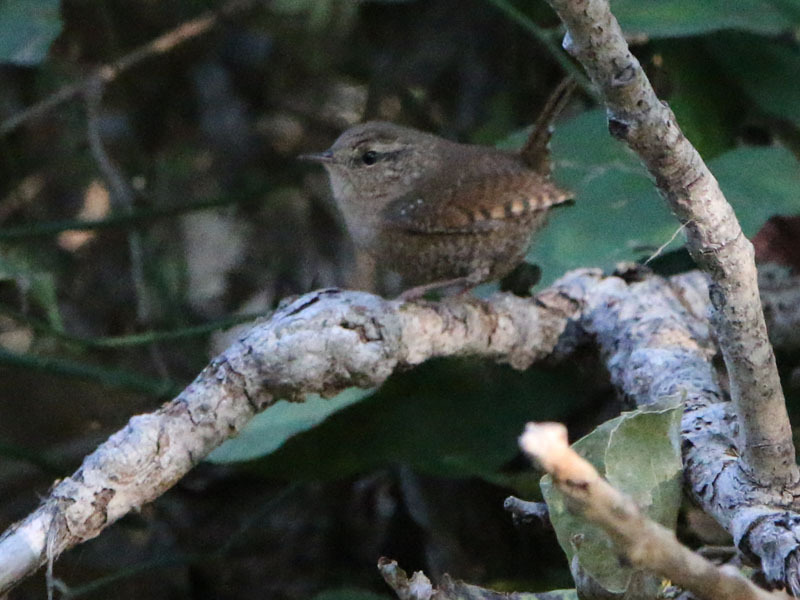 It is unusual to find one alone—especially a first year juvenile like this one. 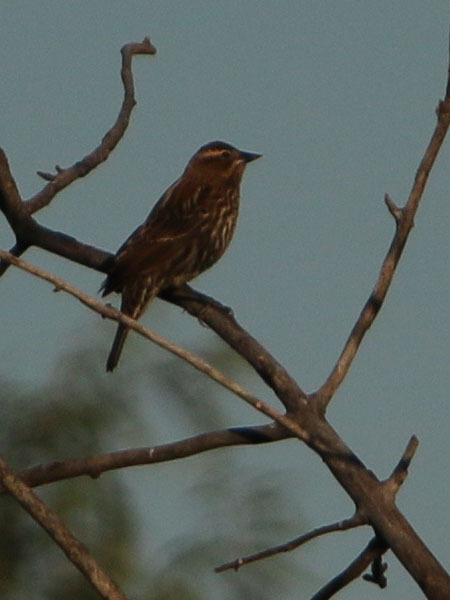 They also typically migrate to the coast and into Mexico for the winter. 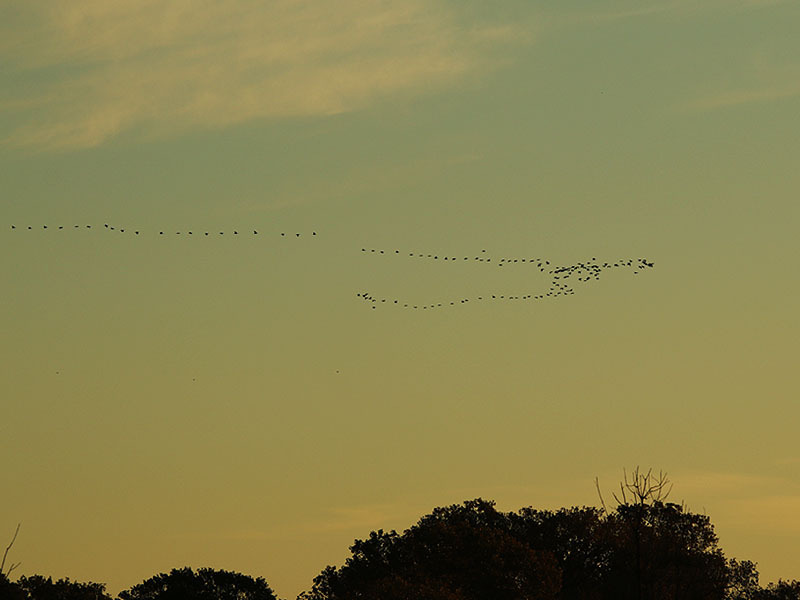 This bird may have been having trouble keeping up with his group—I’m just not sure. I spent quite a bit of time looking at the photographs I took of this bird and zooming in on his injury. I cannot tell from the pictures if the wound is new or if it is healed. In some images it appears as if there is exposed bone, but in other it looks as if small pieces of draped aquatic vegetation are what is responsible for making the wound appear fleshy and open. I hope it is later. 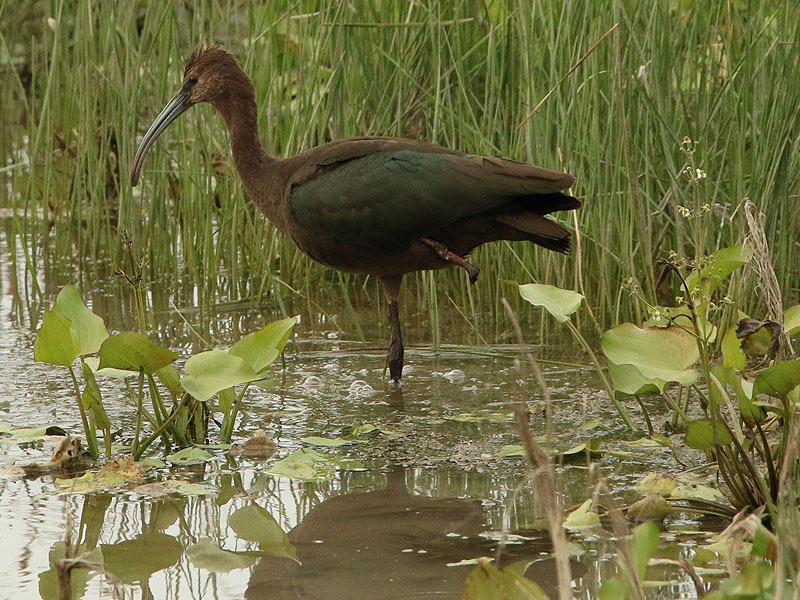 A one-legged juvenile White-faced Ibis. 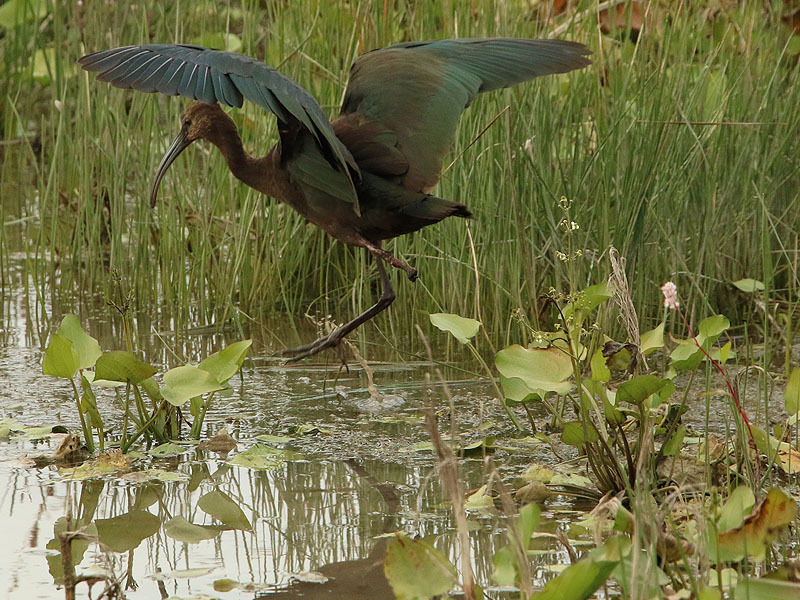 Though handicapped, the ibis seemed healthy and capable. The left leg is missing from the knee down. The ibis foraged competently in spite of his injury. 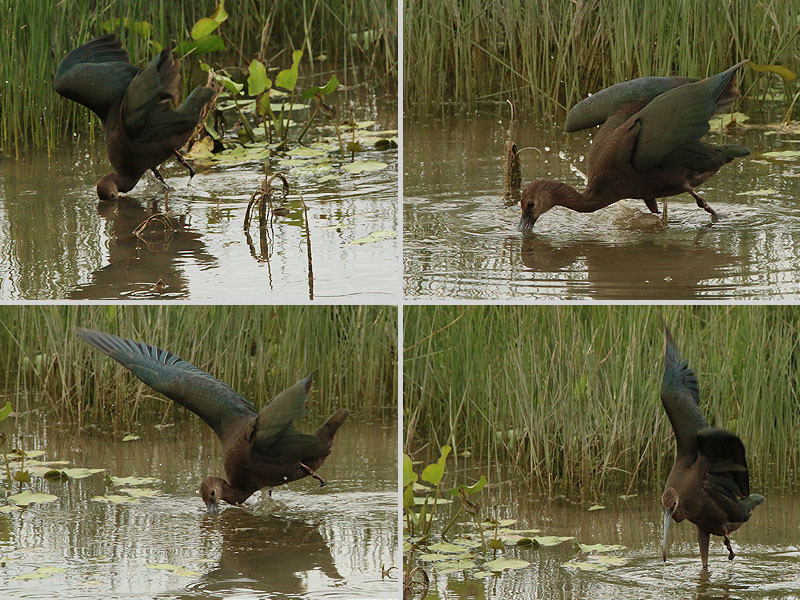 Feeding in a small pool. 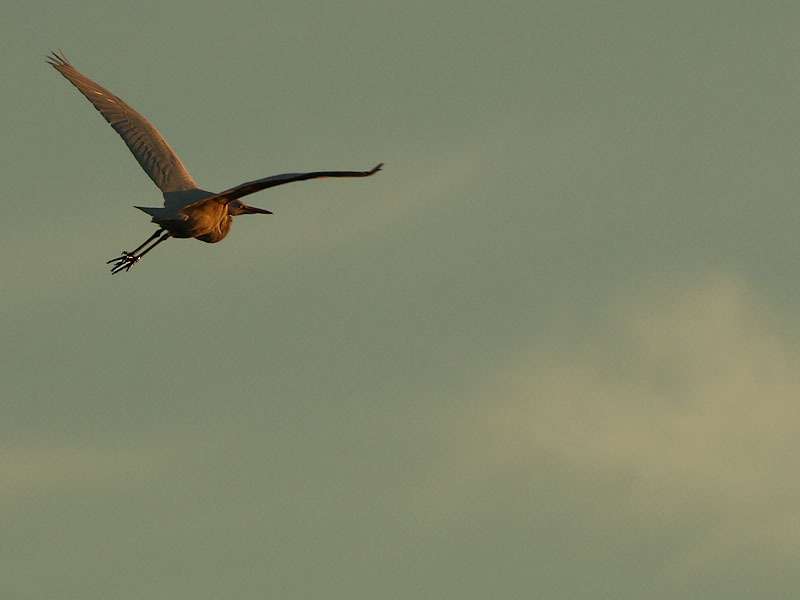 The ibis used his wings for extra balance. 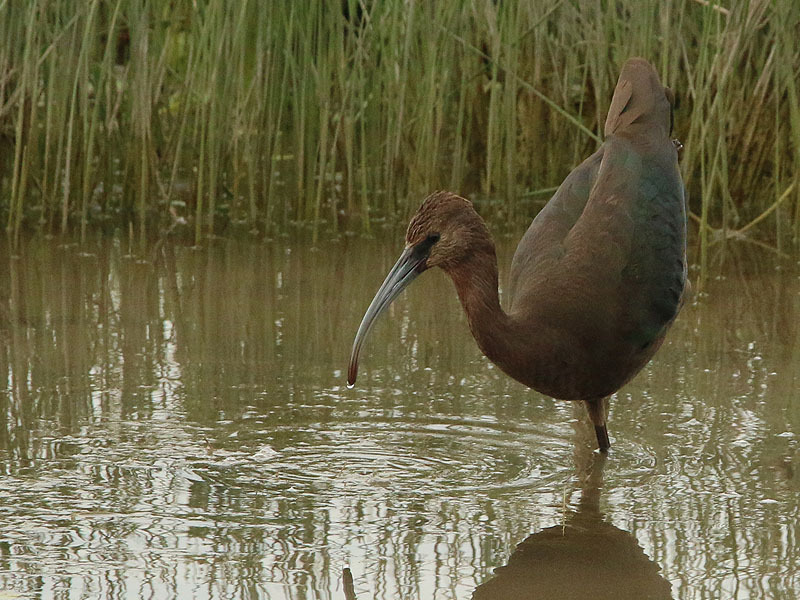 After observing this ibis for and extended period, I was due to head back to the car. I arrived at the gate just in time to be treated to a brilliant and colorful North Texas sunset. The perfect way to end an exciting weekend of hiking and exploring! 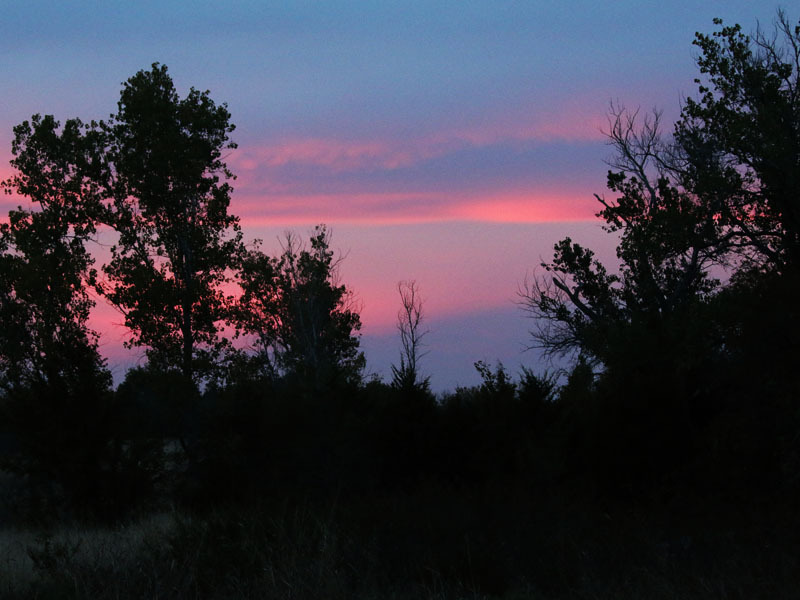 A dramatic sky of pink and purple. 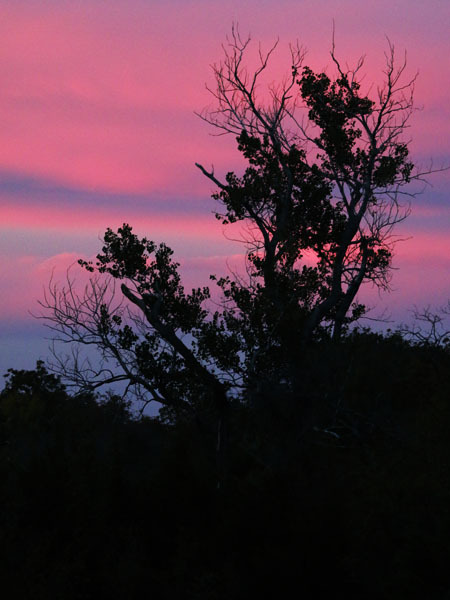 Next Next post: What is the Great Trinity Forest? Chris, really nice documentation of the preserve. I believe that the property is Corps of Engineers land, managed by Denton for educational and recreational purposes. 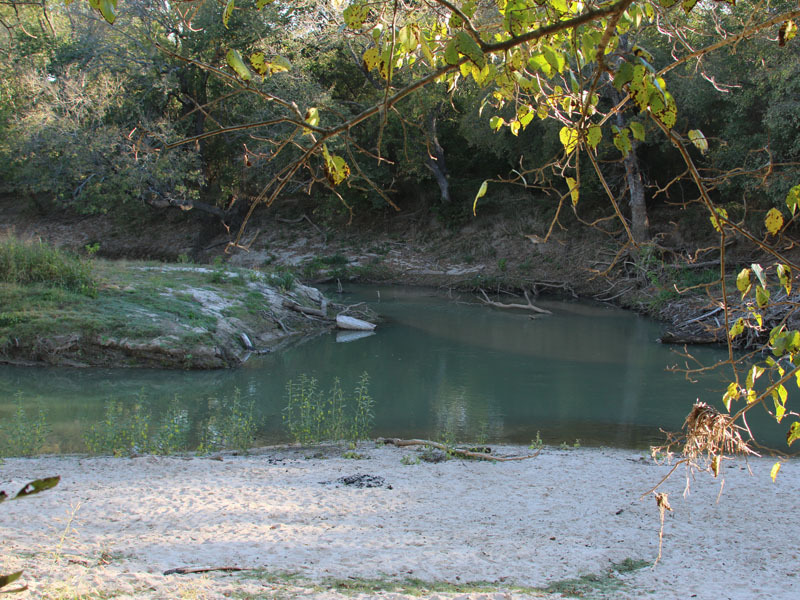 When I was in graduate school at North Texas in the late sixties-early seventies, the confluence of Clear Creek and the Elm Fork were favorite destinations of area fisherman during the spring spawn of White Bass, popularly known in Texas as Sand Bass. Clear Creek was a strongly flowing stream in spring at that time, and probably still is, given the extensive sand deposits you documented. I don’t know if Lake Lewisville harbors the very large White Bass population that it did then. The fish would enter Clear Creek in huge numbers sometimes. It was possible if one hit the creek at the right time to catch 50 fish or more in a couple of hours, using tiny white jigs and an ultra light spinning outfit. Essentially, one would catch one or sometimes two fish on each cast, if using two jigs. Clear Creek is also the stream where I first encountered the large stoneflies of the genus _Perla_. Leaf packs in flowing water hold the striking black and yellow nymphs of this insect, which may exceed 1.5″ in length. 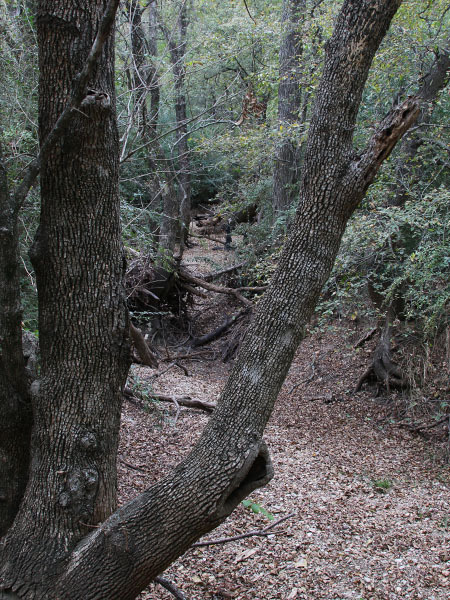 The stream originates from springs in Montague County near the town of Montague. NW of Denton it flows over limestone outcroppings. The stoneflies are more numerous there. I left Denton after completing graduate school, but returned to live there again during the early nineties. I am not sure when the preserve was established, but it was prior to my second period of residence there. In the former time, during the White Bass run, there might be fifty or sixty fisherman vying for space along the creek on weekends. At that time, they could drive their cars right to the confluence. If one wanted to fish, the best time to go was early morning on a weekday to avoid the crowds. This was a really nice park, David. The City of Denton is doing a great job with this place. The Clear Creek confluence is still relatively easy to get to, and would be just a short walk away if you parked on Hartlee Field Road. I’ll make a point of getting back out to the confluence this spring to see what is what. I did not realize it until just now, but my aunt and uncle lived on Clear Creek in Sanger back in the early 1980’s. My uncle was here to work on the Ray Roberts dam. They moved onto a piece of property that had been flooded by the creek just months before. By the end of the summer the creek was mostly dry except for pockets of water here and there. We took a walk through the creek bed one afternoon and collected juvenile perch, bass, and catfish from the standing pools of water. My aunt went out and bought a small ten gallon aquarium to keep them in. I spent a lot of timing exploring up and down the creek near her house. I remember especially enjoying jumping down onto the sandy banks. Quite an interesting report on a “canoeing” trip. The report shows how a true nature lover will find things of interest, regardless of adversity or conditions. When I knew Clear Creek best in the sixties, early seventies, there was never a time when it ceased flowing, even in the fall. But I later saw it that way in the very stretch that you visited when your aunt and uncle lived there, and that the blogger traversed with his friend and dog. 1980 was a record drouth year, and other years following also were quite dry. I know there is still a lot of fishing that continues at Clear Creek. However, I heard that after Lake Ray Roberts was built that a rare species of fish but numerous in Clear Creek at the time, possibly the sand trout mentioned above, has all but disappeared. Do you know what that fish might have been and if it is endangered, locked out of its former habitat, or this story not true at all? The fish mentioned above is the White Bass, or Sand Bass, not the Sand Trout. That fish is not rare at all, but is rather abundant. 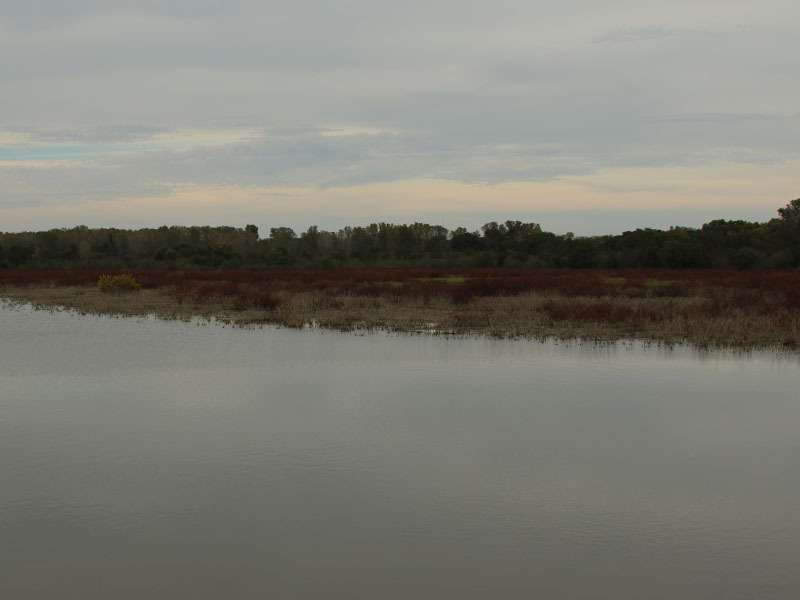 Lake Ray Roberts may have had an impact on the Lake Lewisville population, however, because of a reduction of water flow in the Elm Fork, especially at the time of White Bass spawning. I do not know if that is true or not. Fishermen and fisherwomen might attribute a decline in White Bass populations to the dam, if the decline occurred in the years after establishment, even if other things (eutrophication, long term drouth, pollutants) were the actual causes. The only rare fish in Clear Creek is/was the Scaly Sand Darter (_Ammocrypta vivax_). Clear Creek and Elm Fork, along with other streams in the area with sections of sandy bottom, once had very small populations of this tiny (generally only 2-3 inches long) fish. I have not kept up with whether the population still exists. It is a protected species, rare and seriously declining in parts of its range, but would not be important to fishermen or fisherwomen. Two other darters occur or occurred in both streams, as well, the orangethroat darter _Etheostoma spectabile_), and the bluntnose darter (_Etheostoma chlorosomum_). Both are also tiny fish, but have beautiful markings. The orangethroat darter males have brilliant red or orange and blue colors, heightened during spawning season. 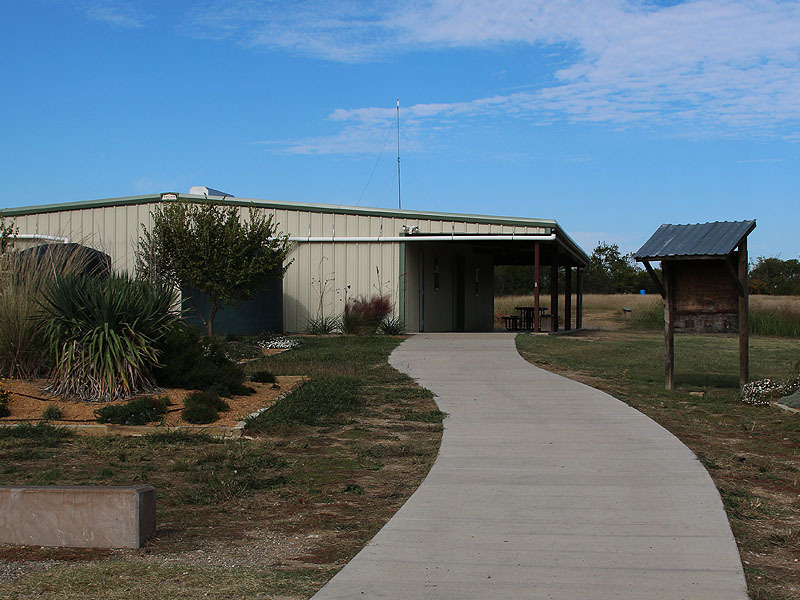 Chris, Thank you so very much for writting and enticing others to visit such a wonderful nature adventure as Clear Creek Natural Heritage Center in Denton, TX . Thoroughly enjoyed the images of nature you included. 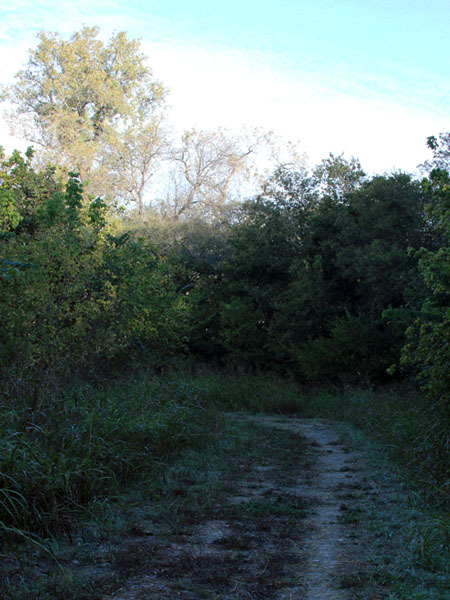 As a Texas Master Naturalist I wanted to tell you about an area you have not ventured into – the quarry area, at Clear Creek. 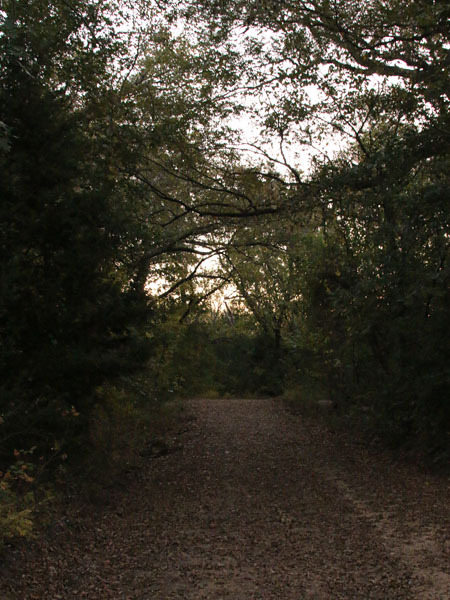 The Denton county Master Nats discovered this area by accident and decided it would make a great place to see fossils and enjoy the curveing trail in the woods and down the stairs and then suddenly open up to a new place to experience nature. Check it out! Yes, that is quite a place you have up there, Jan… A real gem! I will be back, and I will make a point of checking out the Quarry Trail. Great article, great descriptions plus great photos! 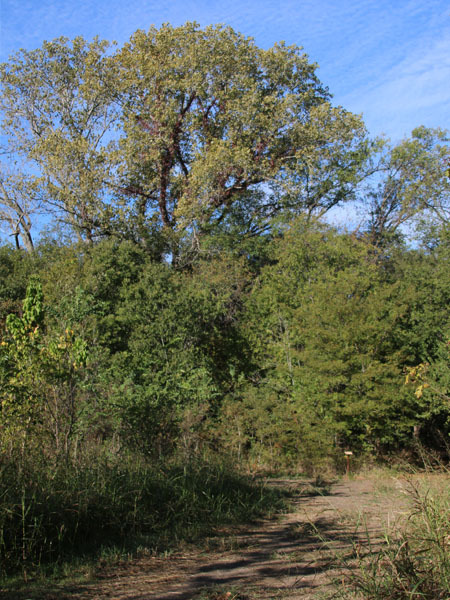 Before I moved back to Missouri I was one of those Master Naturalists that toiled many hours helping make Clear Creek Natural Area what it is today. I haven’t been back there since 2011 and I can see the improvements right away with your photos. That kiosk leading up to the education building would have my initials on it somewhere. The steel bridge over the sometimes flooding creek is a vast improvement along with the newer trail markers.The pond appears to be holding water now but in ’06 it was almost dry from that drought. The Master Gardner’s xeriscape when I last saw it, was just planted and the rainwater collection system was quite the undertaking. I can’t say it enough that I don’t believe that Clear Creek would not be what it is today without the hard work of all the Master Naturalists that volunteered there summer and winter. A special thank you goes out to Jan Frick Thompson and Cheryl Kesterson, two TMN, that led the way and had the vision for today and into the future. Thank you for your comments, Russell. The hard work you guys have put in was quite evident! Everyone involved should be very proud! Thanks for saying so, Sam. I’m glad you liked it! I spent a lot of time in my teenage years at the forks of the creek caught a lot of Sandbass and picked up a lot of poke salad I have very fond memories of this area ! Can you eat the fish from clear creek? 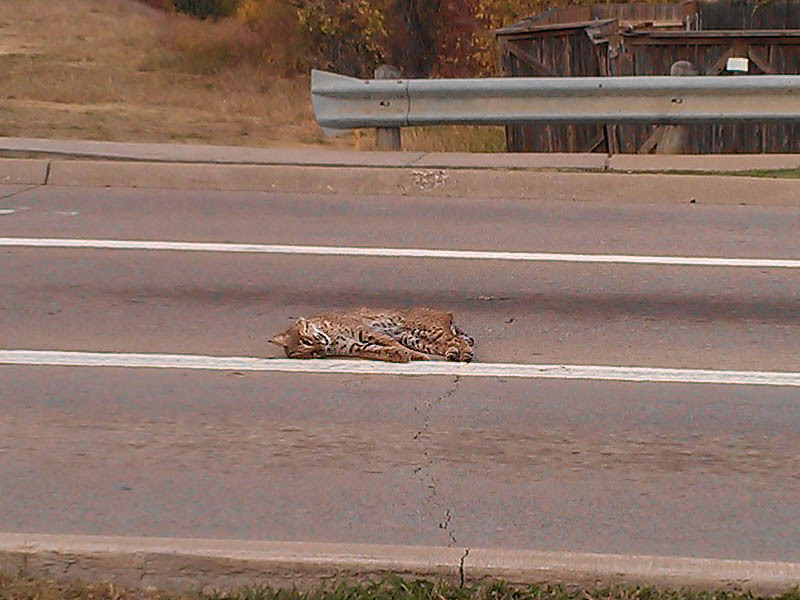 You can certainly eat the fish from Clear Creek. I ate a lot of the white bass that we caught there back in the day. Whether it is wise to do so would depend on the degree of contamination the fish have, which was probably the basis of your question. The upstream catchment area is rural and actually thinly populated, as is the upstream catchment area of the Elm Fork (except for Gainesville, a small town in Cook County), so such things as street runoff are minimal. 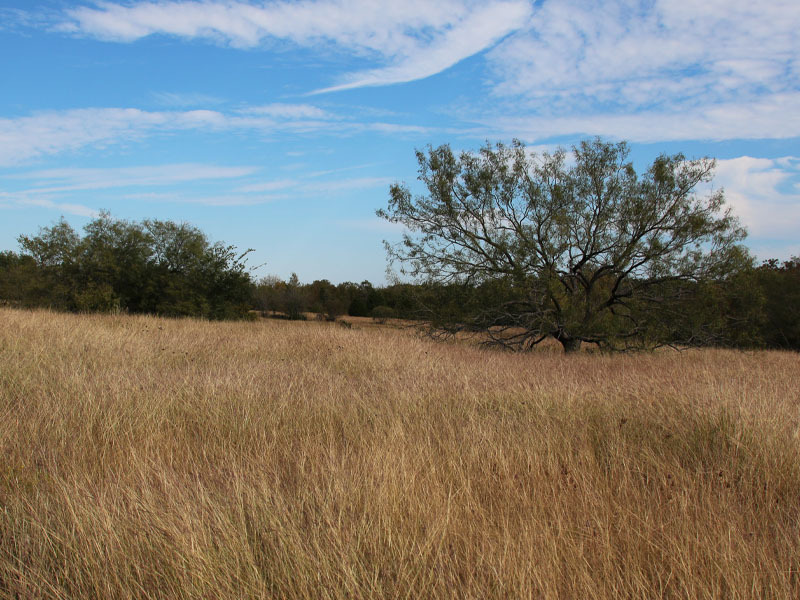 The area is agricultural, though not as heavily row cropped as some of North Texas, more pasture (originally Grand Prairie and Blackland Prarie, and Cross Timbers woodlands). 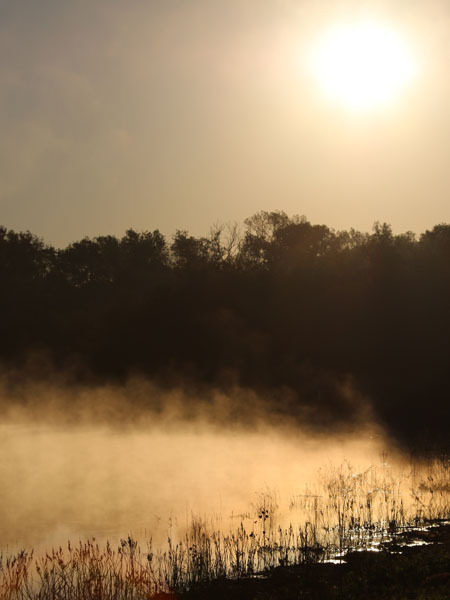 The most compelling reason to avoid eating fish in most Texas streams is mercury levels, which almost universally exceed unrestricted consumption guidelines for largemouth and spotted bass, and in places for some other species like flathead catfish. Clear Creek does not include fishable populations of these species, as it does not have suitable habitat (it is too small). 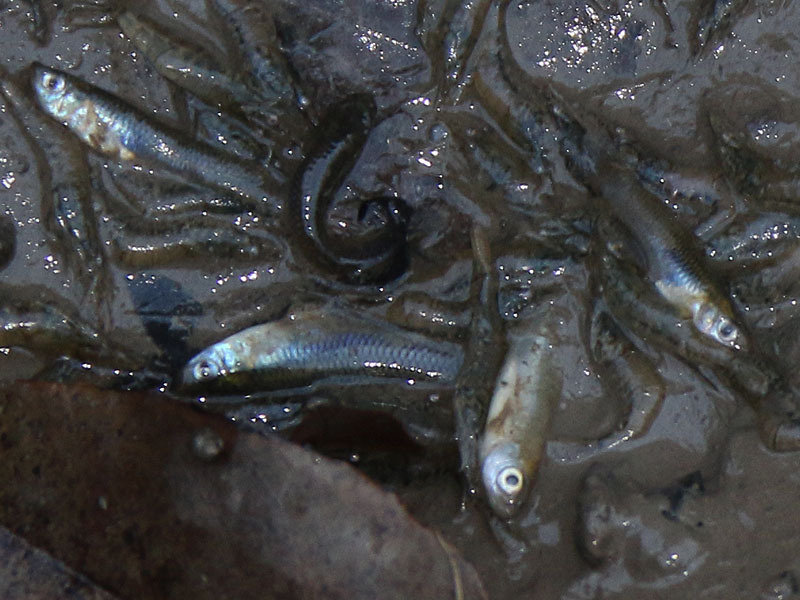 The large majority of the fish caught from Clear Creek are the white bass mentioned above. They are not resident in the creek, but migrate from Lake Lewisville and the Elm Fork at spawning time. They are a short-lived species (most caught would be only 2-3 years old), and not usually considered to accumulate much mercury, though they have some and are on consumption guidance lists for some East Texas reservoirs. The mercury comes from the emissions from coal fired power plants, and the fact that there are none in the vicinity is irrelevant, as the atmospheric mercury is transported long distances and deposited in rain and snow. My name is Caroline, a Denton resident and a former Master Naturalist (class of 2008). I am also a freelance writer in my other career, and I am currently working on an article about Clear Creek for Birdwatching Magazine. 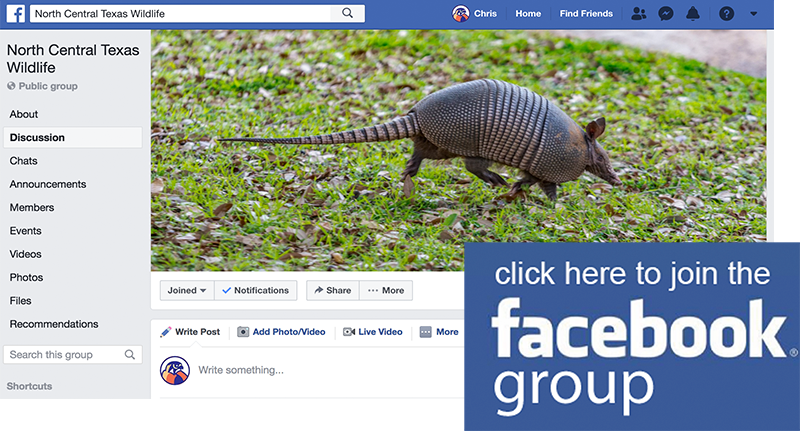 I needed a couple of scenic pictures or unusual birds of Clear Creek: could I use a couple of pictures from this post? I would, of course, give you full credit in the article in Birdwatching mag.